1. CARON H "CARRIE"6 RILEY (JOHN5, EDWARD4, WILLIAM3, EDWARD2, EDWARD1) was born 1810 in Orange County North Carolina, and died 16 Mar 1873 in Dale County Alabama. She married ARIS WOODHAM, JR. 25 Dec 1831 in Darlington District South Carolina, son of ARIS WOODHAM and RACHEL BEASLEY. He was born 02 Jun 1801 in Stokes Bridge, Darlington District, South Carolina, and died 18 Aug 1880 in Dale County Alabama. 2. i. ELIZABETH7 WOODHAM, b. 12 Oct 1832, Georgia; d. 27 Feb 1877, Escambia County Alabama. 3. ii. JOHN ALEXANDER WOODHAM, b. 1833, Henry County Alabama; d. 04 Jun 1865, C.S.A Casualty. Northern Prision Camp, Elmira New York. 4. iii. STEPHEN MOSES WOODHAM, b. Apr 1834, Echo, Dale County Alabama; d. 1908, Dale County Alabama. 5. iv. MARY T. WOODHAM, b. 10 Aug 1835, Dale County Alabama; d. 28 Jun 1909, Dale County Alabama. 6. v. NELLY WOODHAM, b. 20 Aug 1836, Dale County Alabama; d. 20 Aug 1910, Dale County Alabama. vi. IRA ARIS WOODHAM, b. 1839, Dale County Alabama; d. 04 Jun 1865, CSA Casualty. Elmira Prison Camp, New York. Ira served in Company G, Alabama 15th Infantry Regiment CSA. He was captured and imprisoned at Elmira New York where he died. 7. vii. CYNTHIA C. WOODHAM, b. 18 Jan 1842, Dale County Alabama; d. 08 Mar 1921, Walton County Florida. viii. URIAH WOODHAM, b. Feb 1844, Dale County Alabama; d. 1919, Walton County Florida; m. (1) ELIZABETH JANE GRAHAM, 1865, Dale County Alabama; b. 1836, Alabama; d. 1905, Walton County Florida; m. (2) MARY ELIZABETH MARTIN, 15 Feb 1909, Walton County Florida; b. 22 Aug 1873, Alabama. ix. ASA EDWARD WOODHAM, b. 1845, Dale County Alabama; d. 1856, Dale County Alabama. 8. x. ELLEN WOODHAM, b. Apr 1847, Dale County Alabama; d. 10 Oct 1925, West Point, Troup County Georgia. 9. xi. DANIEL WILLIAM WOODHAM, b. 07 Aug 1848, Dale County Alabama; d. 12 Feb 1925, Dale County Alabama. 2. ELIZABETH7 WOODHAM (CARON H "CARRIE"6 RILEY, JOHN5, EDWARD4, WILLIAM3, EDWARD2, EDWARD1) was born 12 Oct 1832 in Georgia, and died 27 Feb 1877 in Escambia County Alabama. She married NEWTON MARION DAVIS 03 May 1849 in Washington County Florida. He was born 08 May 1831 in Burke County Georgia, and died 1915 in Graceville, Jackson County Florida. 10. i. SCINTHA JANE8 DAVIS, b. 07 Apr 1850, Dale County Alabama; d. 12 Jan 1925, Hattisburg, Forrest County Mississippi. ii. T. MALISSA DAVIS, b. 1852, Dale County Alabama. iii. MARY ELIZABETH DAVIS, b. 1856, Dale County Alabama. 11. iv. NEWTON MILTON DAVIS, b. 19 Jun 1855, Dale County Alabama; d. 16 Feb 1956, Hillsborough County Florida. 12. v. NANCY MELVINA DAVIS, b. May 1860, Dale County Alabama; d. 16 Jan 1945, Birmingham, Jefferson County Alabama. vi. FRANCES U. DAVIS, b. 06 Feb 1862, Santa Rosa County Florida. 13. vii. FRANCIS MARION DAVIS, SR, b. 01 Oct 1864, Covington County Alabama; d. 28 Jul 1935, Geneva County Alabama. 14. viii. ROBERT LEWIS DAVIS, b. 29 Jul 1867, Canoe, Escambia County Alabama; d. 1950, Holmes County Florida. 3. JOHN ALEXANDER7 WOODHAM (CARON H "CARRIE"6 RILEY, JOHN5, EDWARD4, WILLIAM3, EDWARD2, EDWARD1) was born 1833 in Henry County Alabama, and died 04 Jun 1865 in C.S.A Casualty. Northern Prision Camp, Elmira New York. He married REBECCA BARNES 1859 in Henry County Alabama, daughter of JOSIAH BARNES and REBECCA TATUM. She was born 23 Apr 1839 in Dale County Alabama, and died 09 Oct 1910 in Dale County Alabama. 15. i. JOHN WEBSTER8 WOODHAM, b. 21 Oct 1862, Dale County Alabama; d. 17 Nov 1946, Ariton, Dale County Alabama. 4. STEPHEN MOSES7 WOODHAM (CARON H "CARRIE"6 RILEY, JOHN5, EDWARD4, WILLIAM3, EDWARD2, EDWARD1) was born Apr 1834 in Echo, Dale County Alabama, and died 1908 in Dale County Alabama. He married SARAH AMANDA JANE GALLOWAY 26 Nov 1856 in Henry County Alabama, daughter of EDWARD GALLOWAY and ELIZABETH WOODHAM. She was born 06 Dec 1834 in Henry County Alabama, and died 1914 in Dale County Alabama. 16. i. JOHN WESLEY8 WOODHAM, b. 17 Oct 1857, Dale County Alabama; d. 14 Jan 1935, Dale County Alabama. ii. NANCY M. WOODHAM, b. Abt. 1859, Dale County Alabama; d. 1908.
iii. SARAH AMANDA JANE WOODHAM, b. Abt. 1864, Dale County Alabama; d. Abt. 1864, Dale County Alabama. iv. STEPHEN WOODHAM, b. Abt. 1864, Dale County Alabama; d. Abt. 1864, Dale County Alabama. 17. v. PERRY CASWELL WOODHAM, SR, b. 14 Oct 1868, Dale County Alabama; d. 30 Dec 1932, Dale County Alabama. 5. MARY T.7 WOODHAM (CARON H "CARRIE"6 RILEY, JOHN5, EDWARD4, WILLIAM3, EDWARD2, EDWARD1) was born 10 Aug 1835 in Dale County Alabama, and died 28 Jun 1909 in Dale County Alabama. She married (1) JOSEPH P. MAUND 23 Dec 1853 in Henry County Alabama, son of WILLIAM MAUND and DORCAS TABBITHA. He was born Abt. 1827 in Houston County Georgia, and died Abt. 1866 in Dale County Alabama. She married (2) WILLIAM JAMES DOSSETT 31 Oct 1867 in Dale County Alabama, son of HIRAM DOSSETT and JANE METCALF. He was born 10 Oct 1839 in Alabama, and died 15 Jul 1914 in Tuscaloosa County Alabama. i. WILLIAM8 MAUND, b. 1857, Dale County Alabama. 18. ii. LUCINDA MAUND, b. 23 Mar 1858, Dale County Alabama; d. 16 Sep 1946.
iii. DONEY MAUND, b. 1859, Dale County Alabama. 19. iv. SAMUEL MALONE MAUND, b. 28 Jun 1863, Dale County Alabama; d. 06 Feb 1920, Marengo County Alabama. 20. v. NELLIE FRANCIS MAUND, b. 1864, Dale County Alabama. vi. MARY MAUND, b. 1865, Dale County Alabama. vii. JOSEPH MAUND, b. 1866, Dale County Alabama. 21. viii. JAMES ELBERT8 DOSSETT, b. 13 Aug 1868, Dale County Alabama; d. 09 Nov 1935, Dale County Alabama. 22. ix. MARTHA JANE DOSSETT, b. 30 Oct 1869, Dale County Alabama; d. 23 Nov 1931, Geneva County Alabama. 23. x. JOHN THOMAS DOSSETT, b. 06 Apr 1871, Dale County Alabama; d. 26 Sep 1953, Dale County Alabama. 6. NELLY7 WOODHAM (CARON H "CARRIE"6 RILEY, JOHN5, EDWARD4, WILLIAM3, EDWARD2, EDWARD1) was born 20 Aug 1836 in Dale County Alabama, and died 20 Aug 1910 in Dale County Alabama. She married MAJOR HOLLAND ( FOX ) DAUGHTRY, son of JOSHUA DAUGHTRY and BARBARA BAKER. He was born 25 Dec 1825 in North Carolina, and died 21 Nov 1906 in Dale County Alabama. 24. i. PHERIBA JANE8 DAUGHTRY, b. Aug 1861, Dale County Alabama. ii. CYNTHIA ALMEDA ANN DAUGHTRY, b. Oct 1858, Dale County Alabama; d. Aft. 1930, Dale County Alabama. iii. PRICILLA DAUGHTRY, b. 1860, Dale County Alabama. iv. MARY H. DAUGHTRY, b. 11 Mar 1860, Dale County Alabama; d. Abt. 1912, Ozark, Dale County Alabama; m. ICHABUD B. MIXON; b. 13 Dec 1870, Dale County Alabama; d. 03 Mar 1945, Ozark, Dale County Alabama. v. S. J. DAUGHTRY, b. 1862, Dale County Alabama. 25. vi. MARTIN JACKSON DAUGHTRY, b. 23 Dec 1862, Dale County Alabama; d. 11 Oct 1902, Dale County Alabama. 26. vii. ALBERT OLIVER DAUGHTRY, b. 1867, Dale County Alabama; d. 1901, Dale County Alabama. 27. viii. MEDIA A. M. DAUGHTRY, b. 1867, Dale County Alabama; d. 16 Nov 1931, Ozark, Dale County Alabama. ix. ELMEDIA DAUGHTRY, b. 1868, Dale County Alabama. x. J. T. DAUGHTRY, b. 1869, Dale County Alabama. 28. xi. CARRIE CORDELIA DAUGHTRY, b. 1871, Dale County Alabama; d. Nov 1939, Dothan, Houston County Alabama. 29. xii. JAMES WILBURN DAUGHTRY, b. 01 Apr 1875, Dale County Alabama; d. 08 Nov 1960, Dothan, Houston County Alabama. 30. xiii. SAMUEL HILBURN DAUGHTRY, b. 22 Jun 1876, Dale County Alabama; d. 14 Nov 1941, Ozark, Dale County Alabama. 31. xiv. IDA T. DAUGHTRY, b. 1878, Dale County Alabama; d. 15 Oct 1918, Ozark, Dale County Alabama. xv. ROSA DAUGHTRY, b. 1879, Dale County Alabama; d. 02 Dec 1959, Halifax County North Carolina. 7. CYNTHIA C.7 WOODHAM (CARON H "CARRIE"6 RILEY, JOHN5, EDWARD4, WILLIAM3, EDWARD2, EDWARD1) was born 18 Jan 1842 in Dale County Alabama, and died 08 Mar 1921 in Walton County Florida. She married (1) R.A.A. WRIGHT. He was born 1841. She married (2) HARDY MELVIN MAUND 1867 in Dale County Alabama, son of WILLIAM MAUND and DORCAS TABBITHA. He was born Dec 1844 in Dale County Alabama, and died Bet. 1900 - 1910 in Dale County Alabama. Hardy served the CSA in the 57th. Alabama Infantry Regiment Company I .
i. MARY ELIZABETH8 MAUND, b. 1867, Dale County Alabama; d. 1926, Leon County Florida. 32. ii. JULIA ANN MAUND, b. 1874, Florida; d. 1938, Walton County Florida. 8. ELLEN7 WOODHAM (CARON H "CARRIE"6 RILEY, JOHN5, EDWARD4, WILLIAM3, EDWARD2, EDWARD1) was born Apr 1847 in Dale County Alabama, and died 10 Oct 1925 in West Point, Troup County Georgia. She married (1) ELIAS KING PIPPIN Abt. 1868 in Washington County Florida, son of GRIFFIN PIPPIN and RAMATHEA. He was born Abt. 1850 in Division 3, Walton County Florida, and died 1875 in Vernon, Washington County Florida. She married (2) JAMES T. MORRIS 1879 in Washington County Florida. He was born Apr 1851 in Alabama. 33. i. WILLIAM ARCH8 PIPPIN, b. 1869, Washington County Florida; d. 1938, Washington County Florida. ii. DAU PIPPIN, b. 1870, Washington County Florida. 34. iii. HENRY JOHNSON PIPPIN, b. 22 Nov 1873, Washington County Florida; d. 19 May 1926, Andalusia, Covington County Alabama. iv. GLEN PIPPIN, b. 1974, Washington County Florida. 35. v. JAMES FARLEY8 MORRIS, b. 21 Sep 1886, Washington County Florida; d. 07 Jan 1974, Bay County Florida. 36. vi. GENERAL JACKSON MORRIS, b. 26 May 1890, Washington County Florida. 9. DANIEL WILLIAM7 WOODHAM (CARON H "CARRIE"6 RILEY, JOHN5, EDWARD4, WILLIAM3, EDWARD2, EDWARD1) was born 07 Aug 1848 in Dale County Alabama, and died 12 Feb 1925 in Dale County Alabama. He married MARTHA ANN ENFINGER 14 Oct 1869 in Dale County Alabama, daughter of ELLIS ENFINGER and MATILDA TILLER. She was born 19 Mar 1854 in Dale County Alabama, and died 1913 in Dale County Alabama. 37. i. WALTER LEWIS8 WOODHAM, b. 03 Apr 1875, Dale County Alabama; d. May 1936, Midland City, Dale County Alabama. 38. ii. BARTOW EDWARD WOODHAM, b. 25 Jun 1885, Dale County Alabama; d. 03 Feb 1940, Ozark, Dale County Alabama. 39. iii. MARVIN BISHOP WOODHAM, b. 01 Jun 1887, Dale County Alabama; d. 10 Sep 1937, Dale County Alabama. iv. MARTHA MATTIE WOODHAM, b. 05 Jan 1889, Dale County Alabama; d. 13 Apr 1964, Midland City, Dale County Alabama. v. WILLIAM ROBERTSON WOODHAM, b. 19 Nov 1894, Dale County Alabama; d. 31 Oct 1971, Dale County Alabama; m. ANNA; b. 1900, New York. 10. SCINTHA JANE8 DAVIS (ELIZABETH7 WOODHAM, CARON H "CARRIE"6 RILEY, JOHN5, EDWARD4, WILLIAM3, EDWARD2, EDWARD1) was born 07 Apr 1850 in Dale County Alabama, and died 12 Jan 1925 in Hattisburg, Forrest County Mississippi. She married JOHN THOMAS ARNOLD 1872, son of STERLING ARNOLD and SARAH SELLERS. He was born 19 Mar 1847 in Glynn County Georgia, and died 12 Feb 1926 in Louisianna. 40. i. JOHN MARION9 ARNOLD, b. 14 Jul 1873, Atmore, Escambia County Alabama; d. 24 Jun 1959.
ii. MARY SALINA ARNOLD, b. 09 Dec 1875, Atmore, Escambia County Alabama; d. Jan 1970; m. WALTON P. MEADOW, 25 Nov 1923, Forrest County Mississippi. iii. LAVOSIA OWEN ARNOLD, b. 15 Oct 1877, Atmore, Escambia County Alabama. iv. GERALDINE ELIZABETH ARNOLD, b. 24 Oct 1879, Atmore, Escambia County Alabama; d. Jul 1967; m. THOMAS J. GLADWELL. 41. v. ROBERT ARNOLD, b. 09 Aug 1882, Mt. Pleasant, Marshall County Mississippi; d. 06 Nov 1964.
vi. THOMAS LAKE ARNOLD, b. 18 Mar 1884, Hattisburg, Forrest County Mississippi; d. 25 Jan 1956; m. RUBY BOULES FAUST ORY. vii. HURD DEWITT ARNOLD, b. 28 Jan 1886, Hattisburg, Forrest County Mississippi; d. 24 Oct 1949; m. ANN CRAWLEY. viii. FRANCES ARNOLD, b. 28 Feb 1888, Enon, Forrest County Mississippi. ix. WILLIAM T. ARNOLD, b. 25 Mar 1889, Hattisburg, Forrest County Mississippi; m. MERCA GUICE. x. AGNES MELVINA ARNOLD, b. 14 Oct 1890, Forrest County Mississippi; d. 25 Jul 1948. 11. NEWTON MILTON8 DAVIS (ELIZABETH7 WOODHAM, CARON H "CARRIE"6 RILEY, JOHN5, EDWARD4, WILLIAM3, EDWARD2, EDWARD1) was born 19 Jun 1855 in Dale County Alabama, and died 16 Feb 1956 in Hillsborough County Florida. He married URSULA ANN MILEY 25 May 1875. She was born 20 Oct 1860 in Hillsborough County Florida, and died 31 Oct 1938 in Duval County Florida. Newton Milton was not listed on the 1870 Census with his parents. 42. i. OREGON VALARIE9 DAVIS, b. 09 Aug 1877, Sumter County Florida; d. 1954, Duvall County Florida. 43. ii. IDA OCTAVIA DAVIS, b. 22 Jan 1882, Sumter County Florida; d. 31 Jul 1960, Pasco County Florida. iii. JOHN CLIFFORD DAVIS, b. 02 Oct 1886, Hillsborough County Florida; d. 07 Dec 1904, Hillsborough County Florida. iv. SUSAN LOUISE DAVIS, b. Jan 1888, Hillsborough County Florida; d. Bef. 1900. 44. v. WILLIAM MELTON DAVIS, b. 18 Jan 1888, Hillsborough County Florida; d. 1953, Tampa, Hillsborough County Florida. 45. vi. RUFUS DEBRUE DAVIS, b. 01 Dec 1891, Hillsborough County Florida; d. 23 Jan 1960, Hillsborough County Florida. 46. vii. FRANK EDWARD DAVIS, b. 28 Jan 1894, Hillsborough County Florida; d. 16 May 1970, Tampa, Hillsborough County Florida. viii. MELTON MILEY DAVIS, b. 25 Dec 1897, Hillsborough County Florida; d. 05 Feb 1898, Hillsborough County Florida. ix. HARLEY HARRIS DAVIS, b. 19 Jan 1901, Hillsborough County Florida; d. 05 Feb 1981, Hillsborough County Florida; m. GUSSY WENTWORTH; b. 1903, Alabama. x. HOWARD BARBER, b. 1910, Hillsborough County Florida. Howard Barber is listed as a son of Newton Milton Davis on the 1920 Census. 12. NANCY MELVINA8 DAVIS (ELIZABETH7 WOODHAM, CARON H "CARRIE"6 RILEY, JOHN5, EDWARD4, WILLIAM3, EDWARD2, EDWARD1) was born May 1860 in Dale County Alabama, and died 16 Jan 1945 in Birmingham, Jefferson County Alabama. She married MULFORD C. PARKER Abt. 1880 in Escambia County Alabama, son of DANIEL PARKER and MARTHA HUBBARD. He was born 1858 in Lafayette County Florida, and died 1936 in Ellisville, Jones County Mississippi. 47. i. HONOR ELIZABETH9 PARKER, b. 19 Jan 1882, Escambia County Alabama; d. 27 Jul 1963, Ellisville, Jones County Mississippi. 48. ii. NEWTON MACK PARKER, b. 03 Feb 1884, Jones County Mississippi. iii. LINNIE S. PARKER, b. Dec 1892, Jones County Mississippi. iv. MARY E. PARKER, b. Jun 1893, Jones County Mississippi. v. GRACE PARKER, b. Aug 1896, Jones County Mississippi. vi. VERA C. PARKER, b. 1899, Jones County Mississippi. 13. FRANCIS MARION8 DAVIS, SR (ELIZABETH7 WOODHAM, CARON H "CARRIE"6 RILEY, JOHN5, EDWARD4, WILLIAM3, EDWARD2, EDWARD1) was born 01 Oct 1864 in Covington County Alabama, and died 28 Jul 1935 in Geneva County Alabama. He married FRANCES ELIZABETH CREWS 1887 in Geneva County Alabama. She was born Nov 1870 in Geneva County Alabama, and died 25 Dec 1965 in Sampson, Geneva County Alabama. 49. i. JAMES MICAJAH9 DAVIS, b. 16 Jul 1888, Coffee County Alabama; d. 12 Jan 1969, Clarksburg, Harrison County West Virginia. 50. ii. ANDREW JESSELSON DAVIS, b. 01 Mar 1890, Coffee County Alabama; d. 03 Aug 1974, Enterprise, Coffee County Alabama. iii. ARENA E. DAVIS, b. 1891, Coffee County Alabama. 51. iv. FOX DAVIS, SR, b. 24 Mar 1895, Coffee County Alabama; d. Oct 1979, Sampson, Geneva County Alabama. v. FRANCIS MARION DAVIS, JR, b. 11 Apr 1897, Coffee County Alabama; d. 23 Oct 1927, Geneva County Alabama; m. MINNIE. vi. HUGH CORTILLEY DAVIS, b. 07 Feb 1899, Coffee County Alabama; d. 14 Apr 1935, Sampson, Geneva County Alabama; m. ONIE BOLES; b. 1902, Alabama. vii. MILLIE DAVIS, b. 1901, Coffee County Alabama. 52. viii. HENRY MALCOMB DAVIS, b. 1904, Coffee County Alabama; d. 29 Aug 1938, Sampson, Geneva County Alabama. 53. ix. GAPPER CHARLIE WASHINGTON DAVIS, b. 09 Mar 1905, Coffee County Alabama; d. 18 Apr 1970, Enterprise, Coffee County Alabama. x. VERA DAVIS, b. 1912, Geneva County Alabama. 14. ROBERT LEWIS8 DAVIS (ELIZABETH7 WOODHAM, CARON H "CARRIE"6 RILEY, JOHN5, EDWARD4, WILLIAM3, EDWARD2, EDWARD1) was born 29 Jul 1867 in Canoe, Escambia County Alabama, and died 1950 in Holmes County Florida. He married MIRIAM ROBERTA. She was born Feb 1873 in Georgia, and died Jul 1959 in Holmes County Florida. i. MARIETTA L.9 DAVIS, b. Feb 1892, Escambia County Alabama. ii. CAMILLA DAVIS, b. Dec 1893, Escambia County Alabama. iii. EULA V. DAVIS, b. May 1896, Holmes County Florida. iv. ESSIE DAVIS, b. Jun 1898, Holmes County Florida. v. LEILA DAVIS, b. 1902, Holmes County Florida. vi. ARTHUR MILTON DAVIS, b. 26 Mar 1904, Holmes County Florida; d. 10 Apr 1975, Bradenton, Manatee County Florida. vii. ZELMA M. DAVIS, b. 1906, Holmes County Florida. viii. CARLTON JAHUE DAVIS, b. 15 Sep 1908, Holmes County Florida; d. 02 Jun 1983, Kissimmee, Osceola County Florida. 15. JOHN WEBSTER8 WOODHAM (JOHN ALEXANDER7, CARON H "CARRIE"6 RILEY, JOHN5, EDWARD4, WILLIAM3, EDWARD2, EDWARD1) was born 21 Oct 1862 in Dale County Alabama, and died 17 Nov 1946 in Ariton, Dale County Alabama. He married LOUIJIANNA VADELLA MCLAIN 1886 in Dale County Alabama, daughter of ALEXANDER MCLAIN and AMANDA MATTHEWS. She was born 19 Oct 1867 in Ariton, Dale County Alabama, and died 17 Dec 1923 in Ozark, Dale County Alabama. i. VIDA VILULA9 WOODHAM, b. 01 Jul 1887, Dale County Alabama; d. 06 Jun 1889, Dale County Alabama. 54. ii. TULLIUS DOZIER WOODHAM, b. 16 Mar 1889, Dale County Alabama; d. 08 Jan 1940, Dale County Alabama. 55. iii. MARCUS MORTON WOODHAM, SR, b. 20 Oct 1890, Dale County Alabama; d. 24 Jan 1968, Hartford, Geneva County Alabama. 56. iv. NETA VERLON WOODHAM, b. 12 Nov 1892, Dale County Alabama; d. 07 May 1940, Dale County Alabama. v. EZRA W. WOODHAM, b. 05 May 1896, Dale County Alabama; d. 25 Oct 1907, Dale County Alabama. 57. vi. LORAL D. WOODHAM, SR, b. 21 Nov 1898, Dale County Alabama; d. 20 May 1973, Arab, Marshall County Alabama. 58. vii. ELDIE RAY WOODHAM, b. 23 Feb 1901, Dale County Alabama; d. 26 Oct 1955, Dougherty County Georgia. 59. viii. LERA ELOISE WOODHAM, b. 13 Jan 1907, Dale County Alabama; d. 01 Mar 1976, Montgomery, Montgomery County Alabama. 16. JOHN WESLEY8 WOODHAM (STEPHEN MOSES7, CARON H "CARRIE"6 RILEY, JOHN5, EDWARD4, WILLIAM3, EDWARD2, EDWARD1) was born 17 Oct 1857 in Dale County Alabama, and died 14 Jan 1935 in Dale County Alabama. He married ALMEDIA ELLEN V. HOBBS 1879 in Dale County Alabama, daughter of HENRY HOBBS and AVILA. She was born 05 Mar 1863 in Dale County Alabama, and died 06 Jul 1942 in Dale County Alabama. 60. i. CHARLES MANCIL9 WOODHAM, b. 28 Aug 1880, Dale County Alabama; d. 02 Jan 1960, Dale County Alabama. 61. ii. JESSE ALEXANDER WOODHAM, b. 07 Jan 1882, Dale County Alabama; d. 10 Apr 1948, Ozark, Dale County Alabama. iii. EVIE C. WOODHAM, b. 23 Dec 1883, Dale County Alabama; m. ROBERT EDWARD ANDREWS; b. Feb 1884, Dale County Alabama. 62. iv. JAMES HENRY WOODHAM, b. 12 Apr 1885, Dale County Alabama; d. 30 Sep 1967, Columbus, Muscogee County Georgia. 63. v. CARLTON ODIS WOODHAM, b. 04 Feb 1887, Dale County Alabama; d. 18 Dec 1966, Ozark, Dale County Alabama. 64. vi. LOLA WOODHAM, b. 05 Sep 1889, Dale County Alabama; d. 26 Aug 1967, Ozark, Dale County Alabama. 65. vii. LILLIE WOODHAM, b. 05 Nov 1891, Dale County Alabama; d. 15 Dec 1984, Ozark, Dale County Alabama. viii. MOSES POWELL WOODHAM, b. 04 Sep 1894, Dale County Alabama; d. 13 Oct 1918, Dale County Alabama. 66. ix. MALLIE VERA WOODHAM, b. 07 May 1896, Dale County Alabama; d. 07 Mar 1975, Ozark, Dale County Alabama. 67. x. WESLEY ALVER WOODHAM, b. 27 Jul 1898, Dale County Alabama; d. 06 Aug 1973, Dothan, Houston County Alabama. 68. xi. HERMON WOODHAM, b. 17 Oct 1900, Dale County Alabama; d. 25 Jul 1963, Birmingham, Jefferson County Alabama. xii. ELMEDIA A. WOODHAM, b. 17 Feb 1903, Dale County Alabama; d. 29 Aug 1912, Dale County Alabama. 17. PERRY CASWELL8 WOODHAM, SR (STEPHEN MOSES7, CARON H "CARRIE"6 RILEY, JOHN5, EDWARD4, WILLIAM3, EDWARD2, EDWARD1) was born 14 Oct 1868 in Dale County Alabama, and died 30 Dec 1932 in Dale County Alabama. He married AMANDA JANE CORLEY 29 Mar 1891 in Dale County Alabama. She was born 1875 in Georgia. 69. i. EUSTICE HOUSTON9 WOODHAM, b. 10 May 1891, Dale County Alabama; d. 01 Jan 1933, Houston County Alabama. ii. ADA E. WOODHAM, b. May 1892, Dale County Alabama; m. CARLTON ODIS WOODHAM; b. 04 Feb 1887, Dale County Alabama; d. 18 Dec 1966, Ozark, Dale County Alabama. 70. iii. RAMON LEROY WOODHAM, b. 30 May 1893, Dale County Alabama; d. 13 Feb 1972, Ozark, Dale County Alabama. iv. PERRY CASWELL WOODHAM, JR, b. Jun 1898, Dale County Alabama; d. 08 Mar 1924, Columbus, Muscogee County Georgia; m. MABELL; b. 1902, Georgia. 71. v. LAWRENCE C. WOODHAM, b. 30 Aug 1899, Dale County Alabama; d. 06 Jul 1982, Dallas, Dallas County Texas. vi. RALPH WOODHAM, b. 1905, Dale County Alabama; d. 14 Sep 1927, Lee County Georgia; m. IRENE BLAND. vii. ETHEL WOODHAM, b. 1907, Dale County Alabama. 18. LUCINDA8 MAUND (MARY T.7 WOODHAM, CARON H "CARRIE"6 RILEY, JOHN5, EDWARD4, WILLIAM3, EDWARD2, EDWARD1) was born 23 Mar 1858 in Dale County Alabama, and died 16 Sep 1946. She married JOHN JAMES MATHIS. i. NELLIS OPHELIA9 MATHIS, m. O. M. SHELLEY. 19. SAMUEL MALONE8 MAUND (MARY T.7 WOODHAM, CARON H "CARRIE"6 RILEY, JOHN5, EDWARD4, WILLIAM3, EDWARD2, EDWARD1) was born 28 Jun 1863 in Dale County Alabama, and died 06 Feb 1920 in Marengo County Alabama. He married ANNETTE HUGHES 1895 in Dale County Alabama, daughter of BENNY HUGHES and LYDIA PURVIS. She was born Jan 1874 in Dale County Alabama, and died 23 Jan 1961 in Mobile, Mobile County Alabama. 72. i. EVA PEARL9 MAUND, b. Dec 1897, Dale County Alabama. ii. SEMOLIA MODELL MAUND, b. Aug 1899, Dale County Alabama. iii. ANNIE MAUND, b. 1903, Geneva County Alabama. 20. NELLIE FRANCIS8 MAUND (MARY T.7 WOODHAM, CARON H "CARRIE"6 RILEY, JOHN5, EDWARD4, WILLIAM3, EDWARD2, EDWARD1) was born 1864 in Dale County Alabama. She married ROBERT GRIGGS. 73. i. JOSEPH SHELLEY9 GRIGGS, SR, b. 23 Jan 1905; d. 14 Feb 1965. 21. JAMES ELBERT8 DOSSETT (MARY T.7 WOODHAM, CARON H "CARRIE"6 RILEY, JOHN5, EDWARD4, WILLIAM3, EDWARD2, EDWARD1) was born 13 Aug 1868 in Dale County Alabama, and died 09 Nov 1935 in Dale County Alabama. He married CARMELLA J. BRANNON 15 Dec 1894 in Dale County Alabama, daughter of GREENBERRY BRANNON and NANCY JUDAH. She was born 20 Jun 1878 in Dale County Alabama, and died 14 Dec 1943 in Dale County Alabama. i. ARCHIE MONROE9 DOSSETT, b. 10 Sep 1895, Dale County Alabama; d. 31 Jan 1935, Houston County Alabama. ii. SAMUEL WEBSTER DOSSETT, b. 31 Mar 1899, Dale County Alabama; d. 13 Jan 1973, Ozark, Dale County Alabama. iii. JOHN G. DOSSETT, b. 02 Aug 1903, Dale County Alabama; d. 23 Jun 1966.
iv. ALEX E. DOSSETT, b. 04 Oct 1909, Dale County Alabama; d. 08 Dec 1966, Midland City, Dale County Alabama. v. EDNA ESTELLE DOSSETT, b. 12 Jul 1911, Dale County Alabama; d. 16 Feb 1998, Ozark, Dale County Alabama. 22. MARTHA JANE8 DOSSETT (MARY T.7 WOODHAM, CARON H "CARRIE"6 RILEY, JOHN5, EDWARD4, WILLIAM3, EDWARD2, EDWARD1) was born 30 Oct 1869 in Dale County Alabama, and died 23 Nov 1931 in Geneva County Alabama. She married LEROY H. BRANNON 30 Aug 1894 in Dale County Alabama, son of SEABORN BRANNON and SUSAN JUDAH. He was born 09 Nov 1871 in Dale County Alabama, and died 15 Mar 1941 in Geneva County Alabama. i. MANCIL9 BRANNON, b. 03 Jun 1895, Dale County Alabama; d. 1905. 74. ii. MINNIE BELLE BRANNON, b. 28 Dec 1896, Dale County Alabama; d. 28 Jun 1925, Columbus, Muscogee County Georgia. iii. GUSSIE L. BRANNON, b. 08 Jul 1903, Dale County Alabama. 75. iv. ALMON SEABORN BRANNON, b. 19 Jun 1906, Dale County Alabama; d. 27 May 1979, Escambia County Florida. 23. JOHN THOMAS8 DOSSETT (MARY T.7 WOODHAM, CARON H "CARRIE"6 RILEY, JOHN5, EDWARD4, WILLIAM3, EDWARD2, EDWARD1) was born 06 Apr 1871 in Dale County Alabama, and died 26 Sep 1953 in Dale County Alabama. He married CORNELIA Z. REEVES 08 Nov 1894 in Dale County Alabama, daughter of JAMES REEVES and MARY. She was born 19 Mar 1875 in Georgia, and died 09 Jan 1930 in Ozark, Dale County Alabama. 76. i. MAGGIE ELLEN9 DOSSETT, b. 12 Aug 1895, Dale County Alabama; d. 07 Jan 1960, Ozark, Dale County Alabama. ii. MITTIE ARDELLA DOSSETT, b. 05 Dec 1898, Dale County Alabama; d. 03 Dec 1962, Montgomery, Montgomery County Alabama; m. ALTER LEVI BENEFIELD, 21 Apr 1918, Dale County Alabama; b. 14 Jun 1893, Dale County Alabama; d. 20 Feb 1969, Ozark, Dale County Alabama. iii. WILLIE DOSSETT, b. 24 Apr 1905, Dale County Alabama. iv. BASCOM R. DOSSETT, b. 10 Mar 1907, Dale County Alabama; m. LUCILE; b. 1909, Dale County Alabama. v. ELOISE DOSSETT, b. 1917, Dale County Alabama. 24. PHERIBA JANE8 DAUGHTRY (NELLY7 WOODHAM, CARON H "CARRIE"6 RILEY, JOHN5, EDWARD4, WILLIAM3, EDWARD2, EDWARD1) was born Aug 1861 in Dale County Alabama. She married JOHN CLEVELAND KETCHUM. He died Bef. 1900 in Dale County Alabama. 77. i. HENRY CLAY9 KETCHUM, b. 12 Jul 1883, Dale County Alabama; d. 21 Aug 1973, Ocala, Marion County Alabama. 78. ii. CLEVELAND STEPHEN KETCHUM, b. 22 Sep 1887, Dale County Alabama. iii. ODUS KETCHUM, b. Jun 1889, Dale County Alabama. 25. MARTIN JACKSON8 DAUGHTRY (NELLY7 WOODHAM, CARON H "CARRIE"6 RILEY, JOHN5, EDWARD4, WILLIAM3, EDWARD2, EDWARD1) was born 23 Dec 1862 in Dale County Alabama, and died 11 Oct 1902 in Dale County Alabama. He married BEULAH VIRGINIA MUELLERS 13 Dec 1888 in Dale County Alabama, daughter of JOE MUELLERS and DAISEY LEE. She was born 30 Dec 1868 in Dale County Alabama, and died 14 Jan 1936 in Dothan, Houston County Alabama. i. FLOY9 DAUGHTRY, b. Mar 1890, Dale County Alabama. 79. ii. WALTER MARTIN DAUGHTRY, b. 29 May 1893, Dale County Alabama; d. 16 Jan 1964, Dothan, Houston County Alabama. iii. HILLIE J. DAUGHTRY, b. 16 Oct 1895, Dale County Alabama. iv. LILLIE W. DAUGHTRY, b. Apr 1896, Dale County Alabama. 80. v. NELLIE MAE DAUGHTRY, b. 1897, Dale County Alabama; d. 14 Mar 1965, Dothan, Houston County Alabama. 81. vi. LEWIS L. DAUGHTRY, b. 03 Jan 1898, Dale County Alabama; d. 13 Oct 1983, Stone Mountain, DeKalb County Georgia. vii. ALPHUS REX DAUGHTRY, b. 01 Feb 1899, Dale County Alabama; d. 10 Apr 1991, Newton, Dale County Alabama; m. GLADYS ESTELL HARPER, 1934, Dothan, Houston County Alabama. 26. ALBERT OLIVER8 DAUGHTRY (NELLY7 WOODHAM, CARON H "CARRIE"6 RILEY, JOHN5, EDWARD4, WILLIAM3, EDWARD2, EDWARD1) was born 1867 in Dale County Alabama, and died 1901 in Dale County Alabama. He married WILLIE LULA MIXON 17 Dec 1891 in Dale County Alabama. She was born 1872 in Dale County Alabama. i. LUCY LILLAR9 DAUGHTRY, b. 07 Nov 1892, Dale County Alabama; d. 1986. 82. ii. WILLIAM O. DAUGHTRY, b. 17 Apr 1894, Dale County Alabama; d. Jul 1936, Houston County Alabama. iii. BESSIE DAUGHTRY, b. 1897, Dale County Alabama. 27. MEDIA A. M.8 DAUGHTRY (NELLY7 WOODHAM, CARON H "CARRIE"6 RILEY, JOHN5, EDWARD4, WILLIAM3, EDWARD2, EDWARD1) was born 1867 in Dale County Alabama, and died 16 Nov 1931 in Ozark, Dale County Alabama. She married (1) SAMUEL EDWARD WOODHAM, son of PRESLEY WOODHAM and PERTHENIA WARD. He was born 12 Dec 1839 in Ozark, Dale County Alabama, and died 16 Aug 1928 in Dale County Alabama. She married (2) JAMES POWERS Abt. 1885 in Dale County Alabama. He was born 1858, and died Bef. 1900 in Dale County Alabama. 83. i. LILLIAN R.9 POWERS, b. Jan 1887, Dale County Alabama. ii. DAVID E. POWERS, b. 13 Mar 1889, Dale County Alabama; d. 26 Oct 1932, Mobile, Mobile County Alabama. 84. iii. MAJOR MAJOR SYBURT POWERS, b. Mar 1892, Dale County Alabama; d. 25 Aug 1962, Ozark, Dale County Alabama. 28. CARRIE CORDELIA8 DAUGHTRY (NELLY7 WOODHAM, CARON H "CARRIE"6 RILEY, JOHN5, EDWARD4, WILLIAM3, EDWARD2, EDWARD1) was born 1871 in Dale County Alabama, and died Nov 1939 in Dothan, Houston County Alabama. She married ALONZO A. GLOVER 14 Dec 1890 in Dale County Alabama, son of WILLIAM GLOVER and MARTHA JAMISON. He was born Jun 1869 in Dale County Alabama, and died 10 Feb 1962 in Dothan, Houston County Alabama. i. HILBURN L.9 GLOVER, b. Dec 1892, Dale County Alabama. ii. JAY H. GLOVER, b. Nov 1895.
iii. EURA GLOVER, b. Aug 1897.
iv. HOUSTON C. GLOVER, b. 1901.
v. WILBURN LISLIE GLOVER, b. 1904.
vi. MARTIN HORACIO GLOVER, b. 1908.
vii. MAJOR HOLLAND GLOVER, b. 22 Apr 1911; d. 28 May 1912. 29. JAMES WILBURN8 DAUGHTRY (NELLY7 WOODHAM, CARON H "CARRIE"6 RILEY, JOHN5, EDWARD4, WILLIAM3, EDWARD2, EDWARD1) was born 01 Apr 1875 in Dale County Alabama, and died 08 Nov 1960 in Dothan, Houston County Alabama. He married GYPSIE ELEANOR BURCH 1897 in Dale County Alabama. She was born Dec 1879 in Dale County Alabama, and died 19 Jun 1954 in Dothan, Houston County Alabama. i. ALBERTA9 DAUGHTRY, b. 21 Nov 1898, Dale County Alabama; d. 08 May 1981. 85. ii. MAJOR DEWEY DAUGHTRY, b. 05 Oct 1899, Dale County Alabama; d. 30 Dec 1967, Ozark, Dale County Alabama. iii. MAMIE DAUGHTRY, b. 1902, Geneva County Alabama. 86. iv. ALBERT DAUGHTRY, b. 20 Sep 1903, Geneva County Alabama; d. 03 Oct 1996, Akron, Summit County Ohio. v. ROY HILBURN DAUGHTRY, b. 05 May 1906, Geneva County Alabama; d. Oct 1970, Hartford, Geneva County Alabama. vi. TROY DAUGHTRY, b. 05 May 1906, Geneva County Alabama; d. 18 Oct 1970, Hartford, Geneva County Alabama; m. KATE C. HARRISON, 24 Feb 1922, Hartford, Geneva County Alabama. vii. JAMES B. DAUGHTRY, b. 1909, Geneva County Alabama. viii. EVELYN DAUGHTRY, b. 03 Oct 1914, Geneva County Alabama; d. Jul 1986, Valdosta, Lowndes County Georgia. ix. JAMES ALEX. DAUGHTRY, b. 1917, Geneva County Alabama; d. Jul 1942, Scott County Kansas. x. RALPH MAYNARD DAUGHTRY, b. 23 Oct 1921, Geneva County Alabama; d. 03 Mar 1984, Fairhope, Baldwin County Alabama. 30. SAMUEL HILBURN8 DAUGHTRY (NELLY7 WOODHAM, CARON H "CARRIE"6 RILEY, JOHN5, EDWARD4, WILLIAM3, EDWARD2, EDWARD1) was born 22 Jun 1876 in Dale County Alabama, and died 14 Nov 1941 in Ozark, Dale County Alabama. He married SARA ETTA WATFORD 1899 in Geneva County Alabama. She was born 10 Oct 1881 in Dale County Alabama, and died 11 Jun 1962 in Ozark, Dale County Alabama. 87. i. SANFORD9 DAUGHTRY, b. Apr 1900, Geneva County Alabama; d. 10 Jul 1933, Houston County Alabama. ii. HUBERT DAUGHTRY, b. 1903, Geneva County Alabama; d. 02 Nov 1916, Madrid, Houston County Alabama. iii. NEAL DAUGHTRY, b. 1904, Geneva County Alabama; m. IRENE; b. 1905, Dale County Alabama. iv. RUBY G. DAUGHTRY, b. 1908, Houston County Alabama; d. 12 Aug 1955, Houston County Alabama. v. RUTH DAUGHTRY, b. 1908, Houston County Alabama. vi. LUCILLE DAUGHTRY, b. 1914, Dale County Alabama. vii. EDWARD DAUGHTRY, b. 1917, Dale County Alabama. viii. LUCY DAUGHTRY, b. 1918, Dale County Alabama. ix. VIOLA DAUGHTRY, b. 1920, Dale County Alabama. x. FOX DAUGHTRY, b. 1924, Dale County Alabama. 31. IDA T.8 DAUGHTRY (NELLY7 WOODHAM, CARON H "CARRIE"6 RILEY, JOHN5, EDWARD4, WILLIAM3, EDWARD2, EDWARD1) was born 1878 in Dale County Alabama, and died 15 Oct 1918 in Ozark, Dale County Alabama. She married OSCAR GLOVER 1897 in Dale County Alabama. He was born 02 Jul 1867 in Dale County Alabama, and died 22 Dec 1936 in Ozark, Dale County Alabama. i. ALMA9 GLOVER, b. 1899, Dale County Alabama. ii. IVA GLOVER, b. 18 May 1901, Dale County Alabama; d. May 1982, Ozark, Dale County Alabama. 88. iii. LAMAR W. GLOVER, b. 18 Apr 1902, Dale County Alabama; d. 25 May 1996, Ozark, Dale County Alabama. 89. iv. TEE W. GLOVER, b. 03 Jul 1902, Dale County Alabama; d. 30 Mar 1995, Ozark, Dale County Alabama. v. NELLIE GLOVER, b. 1905, Dale County Alabama. vi. COMER LOU GLOVER, b. 1906, Dale County Alabama. 90. vii. JOHN D. GLOVER, b. 1908, Dale County Alabama. viii. ARTHUR PRESTON GLOVER, b. 12 Nov 1915, Dale County Alabama; d. Nov 1975, Ozark, Dale County Alabama. 32. JULIA ANN8 MAUND (CYNTHIA C.7 WOODHAM, CARON H "CARRIE"6 RILEY, JOHN5, EDWARD4, WILLIAM3, EDWARD2, EDWARD1) was born 1874 in Florida, and died 1938 in Walton County Florida. She married HENRY NOWLING 1889 in Walton County Florida. He was born Jul 1862 in Crenshaw County Alabama, and died 05 Mar 1943 in Walton County Florida. 91. i. CHARLES LEE9 NOWLING, b. 02 Dec 1891, Walton County Florida; d. 24 Apr 1973, Walton County Florida. ii. HETTIE MISSOURI NOWLING, b. 04 Mar 1894, Walton County Florida. iii. ROVE URIAH NOWLING, b. 09 Aug 1897, Walton County Florida; d. 11 Oct 1918, Richland County South Carolina. 92. iv. HILBORN HOBSON NOWLING, b. 07 Feb 1899, Walton County Florida; d. 22 Jan 1954, Escambia County Florida. v. SAMUEL M. NOWLING, b. 1902, Walton County Florida; m. GALE M.; b. 1904, Ohio. 93. vi. ALEXANDER NOWLING, b. 16 Oct 1903, Walton County Florida; d. 07 Oct 1971, DeFuniak Springs, Walton County Florida. 94. vii. JESSE JACK NOWLING, b. 13 Oct 1906, Walton County Florida; d. Mar 1965, Walton County Florida. viii. WILLIE NOWLING, b. 1909, Walton County Florida; d. Feb 1961, Walton County Florida. ix. WALTER H. NOWLING, b. 1911, Walton County Florida; d. Jul 1963, Lake County Florida. x. JEAN NOWLING, b. 1915, Walton County Florida. xi. BABY NOWLING, b. 1930, Upper Alaqua, Walton County Florida. 33. WILLIAM ARCH8 PIPPIN (ELLEN7 WOODHAM, CARON H "CARRIE"6 RILEY, JOHN5, EDWARD4, WILLIAM3, EDWARD2, EDWARD1) was born 1869 in Washington County Florida, and died 1938 in Washington County Florida. He married THEODOSIA L. 1899 in Jackson County Florida. She was born Jul 1880 in Alabama. i. EARNEST9 PIPPIN, b. 1903, Alabama. ii. L. D. S. PIPPIN, b. 1906, Washington County Florida. iii. LUCILLE PIPPIN, b. 1908, Washington County Florida. 34. HENRY JOHNSON8 PIPPIN (ELLEN7 WOODHAM, CARON H "CARRIE"6 RILEY, JOHN5, EDWARD4, WILLIAM3, EDWARD2, EDWARD1) was born 22 Nov 1873 in Washington County Florida, and died 19 May 1926 in Andalusia, Covington County Alabama. He married MALINDA ISABELLE BURDASHAW 16 Aug 1896 in Vernon, Washington County Florida. She was born 29 Nov 1874 in Vernon, Washington County Florida, and died 07 Apr 1961 in Andalusia, Covington County Alabama. 95. i. HENRY DEWEY PIPPIN9 BUSH, b. 16 Jun 1898, Washington County Florida; d. 02 Nov 1960, Opp, Covington County Alabama. 96. ii. PARRY LEE BUSH, b. 17 Dec 1902, Vernon, Washington County Florida; d. Jun 1975, Vernon, Washington County Florida. 97. iii. SARA MARGARET BUSH, b. 05 Mar 1904; d. 13 Jun 1960. 98. iv. ARTHUR JHUE BUSH, b. 29 Apr 1906; d. Apr 1975, Sanford, Seminole County Florida. 99. v. EDWARD PAUL BUSH, b. 29 Sep 1908; d. 05 Sep 1935, Henderson Alabama. 100. vi. HAZEL CHRISTINE BUSH, b. 31 Aug 1910, Slocumb, Houston County Alabama. 101. vii. HERBERT OTIS BUSH, b. 24 Sep 1912; d. 23 Mar 1988, Covington County Alabama. viii. KENNETH LAMAR BUSH, b. 15 Jan 1915, Andalusia, Covington County Alabama; d. 18 Jan 1915, Andalusia, Covington County Alabama. 35. JAMES FARLEY8 MORRIS (ELLEN7 WOODHAM, CARON H "CARRIE"6 RILEY, JOHN5, EDWARD4, WILLIAM3, EDWARD2, EDWARD1) was born 21 Sep 1886 in Washington County Florida, and died 07 Jan 1974 in Bay County Florida. He married MAMIE BELLE BASS 21 Jul 1907 in Jackson County Florida, daughter of THOMAS BASS and MARGARET. She was born 1890 in Washington County Florida, and died Apr 1960 in Washington County Florida. i. CARLIE9 MORRIS, b. Sep 1908, Jackson County Florida. ii. CHARLES J. MORRIS, b. 12 May 1910, Washington County Florida; d. 08 Mar 1981, Bay County Florida. iii. WILLIE BROWN MORRIS, b. 15 Jul 1912, Washington County Florida; d. 19 Mar 1972, Bay County Florida. iv. MINNIE MAE MORRIS, b. 19 Oct 1914, Washington County Florida; d. 26 Nov 1926, Washington County Florida. v. PAUL MORRIS, b. 15 Feb 1917, Washington County Florida; d. 17 Jun 1993, Chipley, Washington County Florida. vi. ALTHA MORRIS, b. 1921, Washington County Florida. vii. EXLEE MORRIS, b. 1924, Washington County Florida. viii. FLORA N. MORRIS, b. 1928, Washington County Florida. 36. GENERAL JACKSON8 MORRIS (ELLEN7 WOODHAM, CARON H "CARRIE"6 RILEY, JOHN5, EDWARD4, WILLIAM3, EDWARD2, EDWARD1) was born 26 May 1890 in Washington County Florida. He married RUBY MAUDE BASS, daughter of CAROLINE. She was born 13 Oct 1896 in Washington County Florida, and died 03 Sep 1977 in Tampa, hillsborough County Florida. i. J. T.9 MORRIS, b. 1913, Washington County Florida. ii. L. C. MORRIS, b. 1915, Washington County Florida. iii. MYRTLE MORRIS, b. 1920, Washington County Florida. iv. D. MORRIS, b. 1922, Washington County Florida. v. ANNIE M. MORRIS, b. 1925, Washington County Florida. 37. WALTER LEWIS8 WOODHAM (DANIEL WILLIAM7, CARON H "CARRIE"6 RILEY, JOHN5, EDWARD4, WILLIAM3, EDWARD2, EDWARD1) was born 03 Apr 1875 in Dale County Alabama, and died May 1936 in Midland City, Dale County Alabama. He married MARY GRANTHAM 22 Sep 1895 in Dale County Alabama, daughter of SHOAT GRANTHAM and TILDA. She was born 29 Jul 1881 in Dale County Alabama, and died 16 Nov 1931 in Midland City, Dale County Alabama. i. TEE9 WOODHAM, b. 1896, Dale County Alabama. 102. ii. BURLEY LEE WOODHAM, b. 14 Nov 1898, Dale County Alabama; d. 08 Mar 1958, Dothan, Houston County Alabama. iii. LEE WOODHAM, b. 1905, Dale County Alabama. iv. WILLIE MAE WOODHAM, b. 29 Nov 1910, Dale County Alabama; d. 24 Jul 1997, Montgomery, Hamilton County Ohio. v. SON WOODHAM, b. 1915, Dale County Alabama; d. 1915, Dale County Alabama. vi. JAMES WOODHAM, b. 18 Apr 1916, Dale County Alabama; d. 24 Oct 1963, Dale County Alabama; m. RUTH; b. 01 Jan 1916, Dale County Alabama; d. 13 Mar 2008, Dothan, Houston County Alabama. vii. EVA MAE WOODHAM, b. 06 Sep 1916, Dale County Alabama; d. 13 Jan 2005, Andalusia, Covington County Alabama. viii. ERA WOODHAM, b. 28 Jul 1918, Dale County Alabama; d. 10 Oct 1976, Houston County Alabama. 38. BARTOW EDWARD8 WOODHAM (DANIEL WILLIAM7, CARON H "CARRIE"6 RILEY, JOHN5, EDWARD4, WILLIAM3, EDWARD2, EDWARD1) was born 25 Jun 1885 in Dale County Alabama, and died 03 Feb 1940 in Ozark, Dale County Alabama. He married EVA PRESTON 19 Apr 1908, daughter of LEONIDIS PRESTON and LIZZIE JOHNSON. She was born 17 Dec 1892 in Dale County Alabama, and died 15 Mar 1973 in Ozark, Dale County Alabama. i. LYNN9 WOODHAM, b. 08 Dec 1908, Dale County Alabama; d. 26 Oct 1970, Ozark, Dale County Alabama. ii. RUTH WOODHAM, b. 1914, Dale County Alabama. iii. ADOLPHUS WILKERSON WOODHAM, b. 18 Dec 1916, Dale County Alabama; d. 18 Feb 1974, Ozark, Dale County Alabama; m. IDA; b. 06 Aug 1923, Dale County Alabama; d. 19 Jun 1999, Ozark, Dale County Alabama. iv. DAVIS WOODHAM, b. 07 Aug 1917, Dale County Alabama; d. Oct 1975, Dale County Alabama. v. LEWIS WOODHAM, b. 06 Jan 1928, Dale County Alabama; d. 05 Jun 1982, Dale County Alabama; m. CHARLES HUGH STRICKLAND, SR; b. 29 Oct 1918; d. 09 Mar 1959.
vi. ALLIE MAE WOODHAM, b. 1911, Dale County Alabama; d. 26 Aug 1912, Midland City, Dale County Alabama. 39. MARVIN BISHOP8 WOODHAM (DANIEL WILLIAM7, CARON H "CARRIE"6 RILEY, JOHN5, EDWARD4, WILLIAM3, EDWARD2, EDWARD1) was born 01 Jun 1887 in Dale County Alabama, and died 10 Sep 1937 in Dale County Alabama. He married MOLLY L. BULL MARSHALL 29 Mar 1908 in Dale County Alabama, daughter of WILLIAM MARSHALL and LUSETTA PARMER. She was born 14 Sep 1886 in Dale County Alabama, and died 08 Sep 1937 in Dale County Alabama. i. K.T.9 WOODHAM, b. 1909, Dale County Alabama; d. 13 Aug 1910, Dale County Alabama. ii. JACK DEMPSEY WOODHAM, b. Mar 1910, Dale County Alabama; d. 08 Jul 1921, Dale County Alabama. 103. iii. CAMMIE LEE WOODHAM, b. 04 Apr 1913, Dale County Alabama; d. 06 Oct 1971, Dale County Alabama. iv. OVIE THOMAS WOODHAM, b. 17 Jul 1917, Dale County Alabama; d. May 1977, Dale County Alabama. v. JAMES OLEN WOODHAM, b. 22 Sep 1922, Dale County Alabama; d. 10 Mar 1973, Enterprise, Coffee County Alabama; m. JEANETTE; b. 25 Apr 1931. 104. vi. PERRY MARLEY WOODHAM, b. 25 Jul 1925, Dale County Alabama; d. 06 Aug 2006, Dothan, Houston County Alabama. vii. WILLIAM FRANKLIN WOODHAM, b. 03 Nov 1930, Dale County Alabama; d. Jul 1980, Newton, Dale County Alabama. 40. JOHN MARION9 ARNOLD (SCINTHA JANE8 DAVIS, ELIZABETH7 WOODHAM, CARON H "CARRIE"6 RILEY, JOHN5, EDWARD4, WILLIAM3, EDWARD2, EDWARD1) was born 14 Jul 1873 in Atmore, Escambia County Alabama, and died 24 Jun 1959. He married LUCY JONES 25 Dec 1900 in Heckla Mississippi. i. BONNIE ILA MARIE10 ARNOLD, b. 18 Oct 1901, Curran Mississippi; d. 30 May 1990.
ii. DOROTHY ELEANOR ARNOLD, b. 22 Jul 1903, Clyde Mississippi; d. 06 May 1986, Pascagoula, Jackson County Mississippi; m. LUTHER TRAVIS SELLERS, 01 Jan 1921.
iii. HERBERT TENNISON ARNOLD, b. 01 Mar 1907; d. 25 Mar 1907.
iv. OSCAR BOWMAN ARNOLD, b. 24 Jan 1908; d. 24 Jun 1908. 41. ROBERT9 ARNOLD (SCINTHA JANE8 DAVIS, ELIZABETH7 WOODHAM, CARON H "CARRIE"6 RILEY, JOHN5, EDWARD4, WILLIAM3, EDWARD2, EDWARD1) was born 09 Aug 1882 in Mt. Pleasant, Marshall County Mississippi, and died 06 Nov 1964. He married INEZ VANARSDEL REDUS. She was born 1886 in Mississippi. i. ROBERT REDUS10 ARNOLD, b. 12 Jul 1907; d. 28 Jul 1984.
ii. FRED LEIGHTON ARNOLD, b. 02 Feb 1909, Hattisburg, Forrest County Mississippi; d. 03 Jul 1963.
iii. RICHARD MARION ARNOLD, b. 20 Nov 1910.
iv. ELIZABETH LEMOYNE ARNOLD, b. 16 May 1914, Ellisville, Jones County Mississippi; d. 20 Jul 1986.
v. EDWARD PERRY ARNOLD, b. 02 Apr 1917, Hattisburg, Forrest County Mississippi; d. 10 Jun 1961, Hattisburg, Forrest County Mississippi. vi. WILLIAM FRANKLIN ARNOLD, b. 23 May 1920, Hattisburg, Forrest County Mississippi; d. 18 Sep 1981. 42. OREGON VALARIE9 DAVIS (NEWTON MILTON8, ELIZABETH7 WOODHAM, CARON H "CARRIE"6 RILEY, JOHN5, EDWARD4, WILLIAM3, EDWARD2, EDWARD1) was born 09 Aug 1877 in Sumter County Florida, and died 1954 in Duvall County Florida. She married HENRY THOMAS MCCRAY 1893 in Hillsborough County Florida, son of MCCRAY and CATHERINE. He was born Sep 1867 in Florida. 105. i. MARSHALL L.10 MCCRAY, b. Dec 1894, Hillsborough County Florida. 106. ii. THOMAS HENRY MCCRAY, b. 28 Apr 1895, Hillsborough County Florida. 43. IDA OCTAVIA9 DAVIS (NEWTON MILTON8, ELIZABETH7 WOODHAM, CARON H "CARRIE"6 RILEY, JOHN5, EDWARD4, WILLIAM3, EDWARD2, EDWARD1) was born 22 Jan 1882 in Sumter County Florida, and died 31 Jul 1960 in Pasco County Florida. She married MILTON COLQUITT NEWBURN. He was born 10 Aug 1876 in Pasco County Florida, and died 1950 in Pasco County Florida. i. AIREE E.10 NEWBURN, b. 29 Jan 1899, Hillsborough County Florida. 107. ii. EVA NEWBURN, b. 1902, Hillsborough County Florida. iii. CLIFFORD C. NEWBURN, b. 1907, Hillsborough County Florida; d. 1937, Hillsborough County Florida. iv. PEARL E. GAGE NEWBURN, b. 1909, Hillsborough County Florida. 44. WILLIAM MELTON9 DAVIS (NEWTON MILTON8, ELIZABETH7 WOODHAM, CARON H "CARRIE"6 RILEY, JOHN5, EDWARD4, WILLIAM3, EDWARD2, EDWARD1) was born 18 Jan 1888 in Hillsborough County Florida, and died 1953 in Tampa, Hillsborough County Florida. He married EDITH. She was born 1901 in Florida. i. S. MARIE10 DAVIS, b. 1917, Hillsborough County Florida. ii. A. NEVADA DAVIS, b. 1918, Hillsborough County Florida. 45. RUFUS DEBRUE9 DAVIS (NEWTON MILTON8, ELIZABETH7 WOODHAM, CARON H "CARRIE"6 RILEY, JOHN5, EDWARD4, WILLIAM3, EDWARD2, EDWARD1) was born 01 Dec 1891 in Hillsborough County Florida, and died 23 Jan 1960 in Hillsborough County Florida. He married MARY PHILO PENN. She was born 26 May 1893 in Florida, and died 25 Jan 1983 in Hillsborough County Florida. i. MARION DEBRUE10 DAVIS, b. 23 Nov 1916, Thonatosassa, Hillsboro County Florida, HH 11, age 19; d. Jul 1972, Pinellas, County Florida. ii. MARY L. DAVIS, b. 1925, Hillsborough County Florida. 46. FRANK EDWARD9 DAVIS (NEWTON MILTON8, ELIZABETH7 WOODHAM, CARON H "CARRIE"6 RILEY, JOHN5, EDWARD4, WILLIAM3, EDWARD2, EDWARD1) was born 28 Jan 1894 in Hillsborough County Florida, and died 16 May 1970 in Tampa, Hillsborough County Florida. He married MARTHA ELIZABETH ROWLAND 13 Mar 1921 in Tampa, Hillsborough County Florida. She was born 31 Aug 1901 in Florida, and died 06 Jan 1997 in Hillsborough County Florida. i. ANN ELIZABETH10 DAVIS, b. 01 Dec 1920, Orlando, Orange County Florida; m. JOHN HARLAN HUTCHINSON; b. 08 Dec 1916; d. Sep 1983, Highlands County Florida. ii. LEO E. DAVIS, b. 1928, Orlando, Orange County Florida. 47. HONOR ELIZABETH9 PARKER (NANCY MELVINA8 DAVIS, ELIZABETH7 WOODHAM, CARON H "CARRIE"6 RILEY, JOHN5, EDWARD4, WILLIAM3, EDWARD2, EDWARD1) was born 19 Jan 1882 in Escambia County Alabama, and died 27 Jul 1963 in Ellisville, Jones County Mississippi. She married FLOYD HERRINGTON 24 Feb 1912 in Jones County Mississippi. He was born 22 Nov 1879 in Jones County Mississippi, and died 05 Jan 1973 in Ellisville, Jones County Mississippi. i. MARY10 HERRINGTON, b. Nov 1915, Winston County Mississippi. ii. WINSTON HERRINGTON, b. Nov 1917, Ellisville, Jones County Mississippi; d. 1959. 48. NEWTON MACK9 PARKER (NANCY MELVINA8 DAVIS, ELIZABETH7 WOODHAM, CARON H "CARRIE"6 RILEY, JOHN5, EDWARD4, WILLIAM3, EDWARD2, EDWARD1) was born 03 Feb 1884 in Jones County Mississippi. He married AILEEN CRAFT 12 Oct 1920 in Forrest County Mississippi. She was born 1900 in Mississippi. i. MACK10 PARKER, b. 1926, Hinds County Mississippi. ii. MARION P. PARKER, b. 1929, Hinds County Mississippi. 49. JAMES MICAJAH9 DAVIS (FRANCIS MARION8, ELIZABETH7 WOODHAM, CARON H "CARRIE"6 RILEY, JOHN5, EDWARD4, WILLIAM3, EDWARD2, EDWARD1) was born 16 Jul 1888 in Coffee County Alabama, and died 12 Jan 1969 in Clarksburg, Harrison County West Virginia. He married LENORA. She was born 14 May 1891 in Alabama, and died Sep 1987 in Opp, Covington County Alabama. i. REUBIN B.10 DAVIS, b. 30 Jul 1912, Geneva County Alabama; d. 03 Mar 1933, Elba, Coffee County Alabama. ii. CARL R. DAVIS, b. 1914, Geneva County Alabama. iii. COLA C. DAVIS, b. 1916, Geneva County Alabama. iv. CLARA M. DAVIS, b. 1918, Geneva County Alabama. v. ARNOLD R. DAVIS, b. 19 Oct 1919, Geneva County Alabama; d. 12 Sep 2009, Opp, Covington County Alabama. vi. EARNESTINE A. DAVIS, b. 1926, Geneva County Alabama. vii. M. ELMER DAVIS, b. 07 May 1928, Geneva County Alabama; d. 15 Nov 1989, Alabama. 50. ANDREW JESSELSON9 DAVIS (FRANCIS MARION8, ELIZABETH7 WOODHAM, CARON H "CARRIE"6 RILEY, JOHN5, EDWARD4, WILLIAM3, EDWARD2, EDWARD1) was born 01 Mar 1890 in Coffee County Alabama, and died 03 Aug 1974 in Enterprise, Coffee County Alabama. He married BESSIE P. H.. She was born 1893 in Alabama. i. EMMA LEE10 DAVIS, b. 1911, Geneva County Alabama. ii. FRANCES CHAPEL DAVIS, b. 1914, Geneva County Alabama. iii. RALPH DAVIS, b. 1920, Geneva County Alabama. iv. JAMES DAVIS, b. 1923, Geneva County Alabama. v. LAMONT DAVIS, b. 1927, Geneva County Alabama. 51. FOX9 DAVIS, SR (FRANCIS MARION8, ELIZABETH7 WOODHAM, CARON H "CARRIE"6 RILEY, JOHN5, EDWARD4, WILLIAM3, EDWARD2, EDWARD1) was born 24 Mar 1895 in Coffee County Alabama, and died Oct 1979 in Sampson, Geneva County Alabama. He married LILLIAN. She was born 10 Mar 1902 in Geneva County Alabama, and died 20 Jan 1973 in Sampson, Geneva County Alabama. i. KATHLEEN10 DAVIS, b. 1923, Geneva County Alabama. ii. FOX DAVIS, JR, b. 09 Mar 1925, Geneva County Alabama; d. 13 Jul 1993, Alachua County Florida. iii. HAROLD GENE DAVIS, b. 30 Oct 1926, Geneva County Alabama; d. 08 Aug 2009, Montgomery, Montgomery County Alabama. 52. HENRY MALCOMB9 DAVIS (FRANCIS MARION8, ELIZABETH7 WOODHAM, CARON H "CARRIE"6 RILEY, JOHN5, EDWARD4, WILLIAM3, EDWARD2, EDWARD1) was born 1904 in Coffee County Alabama, and died 29 Aug 1938 in Sampson, Geneva County Alabama. He married BONNIE B.. She was born 1904 in Coffee County Alabama. i. LELAND10 DAVIS, b. 1928, Geneva County Alabama. 53. GAPPER CHARLIE WASHINGTON9 DAVIS (FRANCIS MARION8, ELIZABETH7 WOODHAM, CARON H "CARRIE"6 RILEY, JOHN5, EDWARD4, WILLIAM3, EDWARD2, EDWARD1) was born 09 Mar 1905 in Coffee County Alabama, and died 18 Apr 1970 in Enterprise, Coffee County Alabama. He married (1) CLEA BELLE Abt. 1925 in Geneva County Alabama. She was born 1906 in Geneva County Alabama. He married (2) BLONDELL A. AVERITT Aft. 1930 in Geneva County Alabama, daughter of MARION AVERETT and CARRIE CREWS. She was born 17 Feb 1915 in Geneva County Alabama, and died 14 Aug 1999 in Sampson, Geneva County Alabama. i. DYKES10 DAVIS, b. 1927, Geneva County Alabama. 54. TULLIUS DOZIER9 WOODHAM (JOHN WEBSTER8, JOHN ALEXANDER7, CARON H "CARRIE"6 RILEY, JOHN5, EDWARD4, WILLIAM3, EDWARD2, EDWARD1) was born 16 Mar 1889 in Dale County Alabama, and died 08 Jan 1940 in Dale County Alabama. He married BUNA ELIZABETH WARR 12 Oct 1910 in Dale County Alabama, daughter of FRANCES. She was born 1893 in Dale County Alabama. i. CLYDE B.10 WOODHAM, b. 06 Sep 1914, Dale County Alabama; d. Jan 1998, Dothan, Houston County Alabama. ii. GRACE M. WOODHAM, b. 1915, Dale County Alabama. iii. RUBY L. WOODHAM, b. 1917, Dale County Alabama. 55. MARCUS MORTON9 WOODHAM, SR (JOHN WEBSTER8, JOHN ALEXANDER7, CARON H "CARRIE"6 RILEY, JOHN5, EDWARD4, WILLIAM3, EDWARD2, EDWARD1) was born 20 Oct 1890 in Dale County Alabama, and died 24 Jan 1968 in Hartford, Geneva County Alabama. He married ALMA CLEMENTS. She was born 1902, and died 1974.
i. ELIZABETH V.10 WOODHAM, b. 1923, Geneva County Alabama. ii. MILDRED J. WOODHAM, b. 1926, Geneva County Alabama. iii. MARCUS M. WOODHAM, b. Jun 1929, Geneva County Alabama. 56. NETA VERLON9 WOODHAM (JOHN WEBSTER8, JOHN ALEXANDER7, CARON H "CARRIE"6 RILEY, JOHN5, EDWARD4, WILLIAM3, EDWARD2, EDWARD1) was born 12 Nov 1892 in Dale County Alabama, and died 07 May 1940 in Dale County Alabama. She married PILLIE POWELL DEAL 10 Dec 1916 in Dale County Alabama, son of WILLIAM DEAL and ELEPHARE TRUITT. He was born 22 Nov 1891 in Dale County Alabama, and died 08 Feb 1944 in Houston County Alabama. 108. i. ERMA RAE10 DEAL, b. 26 Jan 1918, Dale County Alabama; d. 11 Nov 2001, Montgomery, Montgomery County Alabama, HH 3, age 11. 109. ii. CURTIS POWELL DEAL, b. 15 Mar 1919, Dale County Alabama; d. 01 Sep 1995, Newville, Henry County Alabama. 57. LORAL D.9 WOODHAM, SR (JOHN WEBSTER8, JOHN ALEXANDER7, CARON H "CARRIE"6 RILEY, JOHN5, EDWARD4, WILLIAM3, EDWARD2, EDWARD1) was born 21 Nov 1898 in Dale County Alabama, and died 20 May 1973 in Arab, Marshall County Alabama. He married EZMA TRESSIE MCCAGHREN 14 Aug 1925 in Jacksonville, Calhoun County Alabama, daughter of PACE NAWLS MCCAGHREN. She was born 28 Nov 1900 in Spring Garden, Cherokee County Alabama, and died 02 Mar 1993 in Guntersville, Marshall County Alabama. i. LORAL D.10 WOODHAM, JR, b. 21 Nov 1928, Dale County Alabama. ii. DONALD WEBSTER WOODHAM, b. 09 Jul 1929, Marshall County Alabama; d. 18 Jul 1995.
iii. GLYNN AVIS WOODHAM, b. 12 Oct 1930, Marshall County Alabama; d. 25 Jun 1981. 111. iv. CHARLES BRUCE WOODHAM, b. 05 Feb 1938, Union Grove, Marshall County Alabama. 58. ELDIE RAY9 WOODHAM (JOHN WEBSTER8, JOHN ALEXANDER7, CARON H "CARRIE"6 RILEY, JOHN5, EDWARD4, WILLIAM3, EDWARD2, EDWARD1) was born 23 Feb 1901 in Dale County Alabama, and died 26 Oct 1955 in Dougherty County Georgia. He married RUTH Y.. She was born 1912 in Dale County Alabama. i. ALBERT R.10 WOODHAM, b. Dec 1929, Birmingham, Jefferson County Alabama. 59. LERA ELOISE9 WOODHAM (JOHN WEBSTER8, JOHN ALEXANDER7, CARON H "CARRIE"6 RILEY, JOHN5, EDWARD4, WILLIAM3, EDWARD2, EDWARD1) was born 13 Jan 1907 in Dale County Alabama, and died 01 Mar 1976 in Montgomery, Montgomery County Alabama. She married PATE COLQUITT SNELLGROVE 09 Jun 1924 in Dale County Alabama. He was born 1904 in Dale County Alabama. i. FOXON10 SNELLGROVE, b. 1926, Dale County Alabama. ii. CHRISTINE SNELLGROVE, b. 1927, Dale County Alabama. iii. GENE SNELLGROVE, b. May 1929, Dale County Alabama. 60. CHARLES MANCIL9 WOODHAM (JOHN WESLEY8, STEPHEN MOSES7, CARON H "CARRIE"6 RILEY, JOHN5, EDWARD4, WILLIAM3, EDWARD2, EDWARD1) was born 28 Aug 1880 in Dale County Alabama, and died 02 Jan 1960 in Dale County Alabama. He married (1) PERIBA L. 'ZINA' CAIN, daughter of D. CAIN and ARMANDA SNELL. She was born 06 Sep 1883 in Dale County Alabama, and died 22 Mar 1946 in Ozark, Dale County Alabama. He married (2) MITTIE E. REEVES Abt. 1904 in Dale County Alabama, daughter of JAMES REEVES and FRANCES NICHOLSON. She was born May 1873 in Georgia, and died 22 Mar 1923 in Ozark, Dale County Alabama. i. MABEL10 WOODHAM, b. 1927, Dale County Alabama. ii. LEWIE10 WOODHAM, b. 1905, Dale County Alabama; d. 02 Nov 1959, Columbus, Muscogee County Georgia. 61. JESSE ALEXANDER9 WOODHAM (JOHN WESLEY8, STEPHEN MOSES7, CARON H "CARRIE"6 RILEY, JOHN5, EDWARD4, WILLIAM3, EDWARD2, EDWARD1) was born 07 Jan 1882 in Dale County Alabama, and died 10 Apr 1948 in Ozark, Dale County Alabama. He married DAISY BELLE THOMPSON 22 Dec 1945 in Houston County Alabama, daughter of JOHN THOMPSON and CALLIE SHAW. She was born 1884 in Dale County Alabama, and died 24 Nov 1964 in Ozark, Dale County Alabama. 112. i. MOULTON10 WOODHAM, b. 04 Nov 1906, Dale County Alabama; d. 05 Nov 1963, Phenix City, Russell County Alabama. ii. VERLON WOODHAM, b. 25 Nov 1907, Dale County Alabama; d. 27 Mar 2005, Ozark, Dale County Alabama; m. MALCOLM P. GRANTHAM, Bef. 1930, Dale County Alabama; b. 11 Dec 1907, Dale County Alabama. iii. SALLIE MAE WOODHAM, b. 1910, Dale County Alabama. iv. INEZ WOODHAM, b. 30 Nov 1914, Dale County Alabama; d. 06 Oct 1953, Dale County Alabama. v. JOHNNIE PEARL WOODHAM, b. 08 Nov 1919, Dale County Alabama; d. 05 Sep 2002, Ozark, Dale County Alabama. 62. JAMES HENRY9 WOODHAM (JOHN WESLEY8, STEPHEN MOSES7, CARON H "CARRIE"6 RILEY, JOHN5, EDWARD4, WILLIAM3, EDWARD2, EDWARD1) was born 12 Apr 1885 in Dale County Alabama, and died 30 Sep 1967 in Columbus, Muscogee County Georgia. He married EULA ALDONIA WHITLOCK Abt. 1915. She was born Abt. 1890 in Dale County Alabama, and died in Columbus, Muscogee County Georgia. i. ILENE10 WOODHAM, b. 1907, Dale County Alabama. ii. BONNIE WOODHAM, b. 1911, Dale County Alabama. 113. iii. JAMES LAMAR WOODHAM, b. 1916, Dale County Alabama. iv. H. L. WOODHAM, b. 1918, Dale County Alabama. 63. CARLTON ODIS9 WOODHAM (JOHN WESLEY8, STEPHEN MOSES7, CARON H "CARRIE"6 RILEY, JOHN5, EDWARD4, WILLIAM3, EDWARD2, EDWARD1) was born 04 Feb 1887 in Dale County Alabama, and died 18 Dec 1966 in Ozark, Dale County Alabama. He married (1) ADA E. WOODHAM, daughter of PERRY WOODHAM and AMANDA CORLEY. She was born May 1892 in Dale County Alabama. He married (2) CORA F. BARTLETT Abt. 1909. She was born 06 Oct 1892 in Dale County Alabama, and died 06 Oct 1966 in Ozark, Dale County Alabama. 114. i. JOHN D.10 WOODHAM, b. 19 Sep 1910, Dale County Alabama; d. 1975.
ii. R. RARNON WOODHAM, b. 1914, Dale County Alabama. iii. EILON WOODHAM, b. 1917, Dale County Alabama. iv. DEELIE WOODHAM, b. 1919, Dale County Alabama. v. LLOYD POWELL WOODHAM, b. 19 Jan 1922, Dale County Alabama; d. 18 Mar 1941, Dothan, Houston County Alabama; m. CORA FRANCES BARTLOT. vi. LOTTIE WOODHAM, b. 1924, Dale County Alabama. vii. HOWARD WOODHAM, b. 1929, Headland, Henry County Alabama. 64. LOLA9 WOODHAM (JOHN WESLEY8, STEPHEN MOSES7, CARON H "CARRIE"6 RILEY, JOHN5, EDWARD4, WILLIAM3, EDWARD2, EDWARD1) was born 05 Sep 1889 in Dale County Alabama, and died 26 Aug 1967 in Ozark, Dale County Alabama. She married JOHN QUINCY ANDREWS, son of JOHN ANDREWS. He was born 1878 in Dale County Alabama, and died 07 Jun 1966 in Ozark, Dale County Alabama. i. MASON10 ANDREWS, b. 11 Sep 1909, Dale County Alabama; d. Oct 1982, Alabama. ii. COY ANDREWS, b. 10 Dec 1910, Dale County Alabama; d. 21 Oct 1975.
iii. WILLIE MAE ANDREWS, b. 1915, Dale County Alabama. iv. LUCILLE ANDREWS, b. 1918, Dale County Alabama. 65. LILLIE9 WOODHAM (JOHN WESLEY8, STEPHEN MOSES7, CARON H "CARRIE"6 RILEY, JOHN5, EDWARD4, WILLIAM3, EDWARD2, EDWARD1) was born 05 Nov 1891 in Dale County Alabama, and died 15 Dec 1984 in Ozark, Dale County Alabama. She married LOUIS ALONZO POWERS. He was born 1896 in Dale County Alabama. i. O. B.10 POWERS, b. 1918, Dale County Alabama; d. 16 Dec 1961, Mobile, Mobile County Alabama; m. NELLIE. ii. MELLANA POWERS, b. 1921, Dale County Alabama. iii. LOUISE POWERS, b. 1923, Dale County Alabama. iv. FRANCES POWERS, b. 1925, Dale County Alabama. 66. MALLIE VERA9 WOODHAM (JOHN WESLEY8, STEPHEN MOSES7, CARON H "CARRIE"6 RILEY, JOHN5, EDWARD4, WILLIAM3, EDWARD2, EDWARD1) was born 07 May 1896 in Dale County Alabama, and died 07 Mar 1975 in Ozark, Dale County Alabama. She married SAMUEL JASPER MAUND. He was born 1896 in Dale County Alabama. 115. i. ANNIE IRENE10 MAUND, b. 19 Mar 1915, Dale County Alabama; d. 26 Dec 1992, Dothan, Houston County Alabama. ii. ELMER MAUND, b. 1915, Dale County Alabama. iii. ROBERT MAUND, b. Apr 1919, Dale County Alabama. iv. RUTH MAUND, b. 1922, Dale County Alabama. v. HELEN MAUND, b. 1924, Dale County Alabama. vi. MARY MAUND, b. 1928, Dale County Alabama. 67. WESLEY ALVER9 WOODHAM (JOHN WESLEY8, STEPHEN MOSES7, CARON H "CARRIE"6 RILEY, JOHN5, EDWARD4, WILLIAM3, EDWARD2, EDWARD1) was born 27 Jul 1898 in Dale County Alabama, and died 06 Aug 1973 in Dothan, Houston County Alabama. He married ONA PEARL SKINNER 1919 in Dale County Alabama. She was born 02 Apr 1902 in Dale County Alabama, and died Mar 1984 in Midland City, Dale County Alabama. i. CLYDE10 WOODHAM, b. 1920, Dale County Alabama. ii. JAMES WOODHAM, b. 09 Apr 1922, Dale County Alabama; d. 01 Dec 1987, Ozark, Dale County Alabama. iii. DOUGLAS RUSSELL WOODHAM, b. 10 Apr 1923, Dale County Alabama; d. 02 Aug 1982, Panama City, Bay County Florida. iv. J. C. WOODHAM, b. 12 Nov 1924, Dale County Alabama; d. 03 Jul 1994, New Brockton, Coffee County Alabama. v. TOMMIE E. WOODHAM, b. 13 Oct 1927, Dale County Alabama; d. 24 Dec 2001, Ozark, Dale County Alabama. 68. HERMON9 WOODHAM (JOHN WESLEY8, STEPHEN MOSES7, CARON H "CARRIE"6 RILEY, JOHN5, EDWARD4, WILLIAM3, EDWARD2, EDWARD1) was born 17 Oct 1900 in Dale County Alabama, and died 25 Jul 1963 in Birmingham, Jefferson County Alabama. He married BLUNIA GRANTHAM. She was born 29 Sep 1900 in Dale County Alabama, and died 23 May 1965.
i. EVIE LEE10 WOODHAM, b. 03 Sep 1922, Dale County Alabama; m. CHARLES LEAMON BLAIR; b. 06 May 1916; d. 08 Feb 1996.
ii. IMOGENE WOODHAM, b. 10 May 1925, Dale County Alabama; d. 11 Apr 1927.
iii. JEROME WOODHAM, b. 26 Aug 1927, Dale County Alabama; m. MARY SUE; b. 02 Jan 1928; d. 18 Dec 2000.
iv. INFANT WOODHAM, b. 30 Jan 1929, Dale County Alabama; d. 01 Feb 1929, Dale County Alabama. 116. v. LEWIS WOODHAM, b. 18 Dec 1931, Chalkhead Community, Dale County Alabama; d. 29 Jun 1998, Ozark, Dale County Alabama. 117. vi. BILLY EDSEL WOODHAM, b. 26 Sep 1937, Dale County Alabama. 69. EUSTICE HOUSTON9 WOODHAM (PERRY CASWELL8, STEPHEN MOSES7, CARON H "CARRIE"6 RILEY, JOHN5, EDWARD4, WILLIAM3, EDWARD2, EDWARD1) was born 10 May 1891 in Dale County Alabama, and died 01 Jan 1933 in Houston County Alabama. He married MAY. She was born 1902 in Dale County Alabama. i. MILDRED10 WOODHAM, b. 1919, La Grange, Troup County Georgia. ii. JOSEPH WOODHAM, b. 1922, La Grange, Troup County Georgia; d. 31 May 1930, Houston County Alabama. iii. PAUL WOODHAM, b. 1924, Houston County Alabama. iv. RUBY M. WOODHAM, b. 1926, Houston County Alabama. v. ROY G. WOODHAM, b. 1928, Houston County Alabama. 70. RAMON LEROY9 WOODHAM (PERRY CASWELL8, STEPHEN MOSES7, CARON H "CARRIE"6 RILEY, JOHN5, EDWARD4, WILLIAM3, EDWARD2, EDWARD1) was born 30 May 1893 in Dale County Alabama, and died 13 Feb 1972 in Ozark, Dale County Alabama. He married ANNA. She was born 1894 in Dale County Alabama. i. VELMA10 WOODHAM, b. 1914, Dale County Alabama. ii. HERBERT WOODHAM, b. 1916, Dale County Alabama. 71. LAWRENCE C.9 WOODHAM (PERRY CASWELL8, STEPHEN MOSES7, CARON H "CARRIE"6 RILEY, JOHN5, EDWARD4, WILLIAM3, EDWARD2, EDWARD1) was born 30 Aug 1899 in Dale County Alabama, and died 06 Jul 1982 in Dallas, Dallas County Texas. He married ELSIE BORDERS. She was born 1903 in Georgia, and died 20 May 1993 in Tarrant County Texas. i. JACK D.10 WOODHAM, b. 17 Jan 1921, Habersham County Georgia; d. 08 May 1989, Irving, Dallas County Texas. ii. ELSIE E. WOODHAM, b. 1923, Habersham County Georgia. 72. EVA PEARL9 MAUND (SAMUEL MALONE8, MARY T.7 WOODHAM, CARON H "CARRIE"6 RILEY, JOHN5, EDWARD4, WILLIAM3, EDWARD2, EDWARD1) was born Dec 1897 in Dale County Alabama. She married SMITH. i. FRANCES10 SMITH, b. 1918, Geneva County Alabama. ii. CAROLYN SMITH, b. 1920, Geneva County Alabama. 73. JOSEPH SHELLEY9 GRIGGS, SR (NELLIE FRANCIS8 MAUND, MARY T.7 WOODHAM, CARON H "CARRIE"6 RILEY, JOHN5, EDWARD4, WILLIAM3, EDWARD2, EDWARD1) was born 23 Jan 1905, and died 14 Feb 1965. 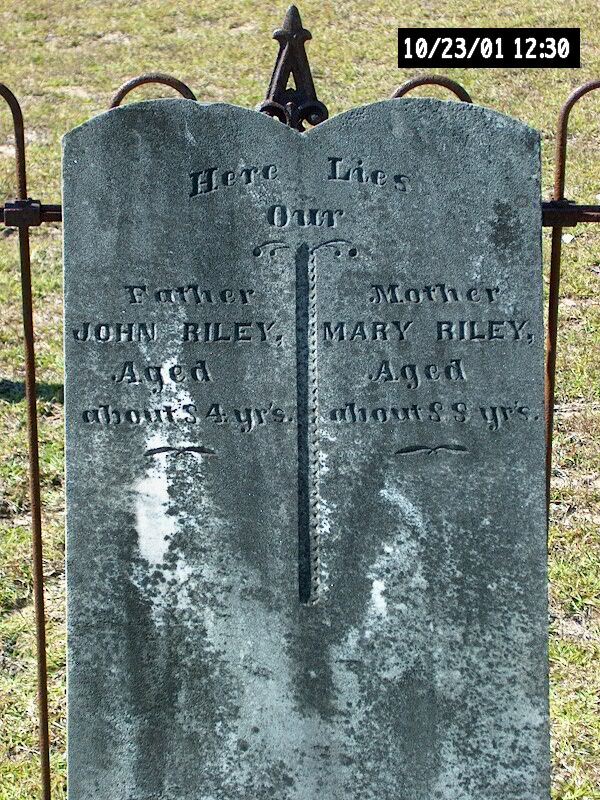 He married OLBA W. MIMS 28 Feb 1925, daughter of JOHN MIMS and LAUTER RILEY. She was born 15 Jan 1908 in Dale County Alabama, and died 30 Nov 1989. 118. i. JOHN ROBERT10 GRIGGS, b. 03 Jan 1926; d. 23 May 1994. 119. ii. JOSEPH SHELLEY GRIGGS, JR, b. 22 Feb 1928, Dale County Alabama; d. 21 Apr 1982. 74. MINNIE BELLE9 BRANNON (MARTHA JANE8 DOSSETT, MARY T.7 WOODHAM, CARON H "CARRIE"6 RILEY, JOHN5, EDWARD4, WILLIAM3, EDWARD2, EDWARD1) was born 28 Dec 1896 in Dale County Alabama, and died 28 Jun 1925 in Columbus, Muscogee County Georgia. She married RUEBEN ERNEST RILEY 12 Nov 1914 in Dale County Alabama, son of WILLIAM RILEY and MARGEAN JOHNSON. He was born 30 Aug 1892 in Dale County Alabama, and died in Columbus, Muscogee County Georgia. i. MABEL10 RILEY, b. Oct 1915. 120. ii. LEROY LAMAR RILEY, b. 09 Dec 1921; d. 16 Dec 1991, Columbus, Muscogee County Alabama. 75. ALMON SEABORN9 BRANNON (MARTHA JANE8 DOSSETT, MARY T.7 WOODHAM, CARON H "CARRIE"6 RILEY, JOHN5, EDWARD4, WILLIAM3, EDWARD2, EDWARD1) was born 19 Jun 1906 in Dale County Alabama, and died 27 May 1979 in Escambia County Florida. He married EDNA CARRIE. i. TERRELL LEO10 BRANNON, b. 1933, Holmes County Florida. 76. MAGGIE ELLEN9 DOSSETT (JOHN THOMAS8, MARY T.7 WOODHAM, CARON H "CARRIE"6 RILEY, JOHN5, EDWARD4, WILLIAM3, EDWARD2, EDWARD1) was born 12 Aug 1895 in Dale County Alabama, and died 07 Jan 1960 in Ozark, Dale County Alabama. She married JOHN C. BALDWIN. He was born 1882 in Dale County Alabama. i. PAULINE10 BALDWIN, b. 1913, Dale County Alabama. 77. HENRY CLAY9 KETCHUM (PHERIBA JANE8 DAUGHTRY, NELLY7 WOODHAM, CARON H "CARRIE"6 RILEY, JOHN5, EDWARD4, WILLIAM3, EDWARD2, EDWARD1) was born 12 Jul 1883 in Dale County Alabama, and died 21 Aug 1973 in Ocala, Marion County Alabama. He married CARA J.. She was born 1882 in Georgia. 121. i. HUEY LEE10 KETCHUM, SR, b. 1906, Geneva County Alabama; d. Jan 1967, Columbia County Florida. ii. JEWELL KETCHUM, b. Nov 1909, Geneva County Alabama. iii. REX KETCHUM, b. 1915, Geneva County Alabama. 78. CLEVELAND STEPHEN9 KETCHUM (PHERIBA JANE8 DAUGHTRY, NELLY7 WOODHAM, CARON H "CARRIE"6 RILEY, JOHN5, EDWARD4, WILLIAM3, EDWARD2, EDWARD1) was born 22 Sep 1887 in Dale County Alabama. He married ADA J. REEVES. She was born 1888 in Georgia. i. RAY10 KETCHUM, b. 1905, Geneva County Alabama. ii. GRADY KETCHUM, b. 1910, Geneva County Alabama. iii. RUBY T. KETCHUM, b. 1912, Geneva County Alabama. iv. J. B. KETCHUM, b. 1914, Geneva County Alabama. v. CLEVELAND MORRIS KETCHUM, b. 1917, Geneva County Alabama. vi. LOUISE KETCHUM, b. 1919, Geneva County Alabama. vii. WARREN L. KETCHUM, b. 1921, Geneva County Alabama. 79. WALTER MARTIN9 DAUGHTRY (MARTIN JACKSON8, NELLY7 WOODHAM, CARON H "CARRIE"6 RILEY, JOHN5, EDWARD4, WILLIAM3, EDWARD2, EDWARD1) was born 29 May 1893 in Dale County Alabama, and died 16 Jan 1964 in Dothan, Houston County Alabama. He married VIRGIE L.. She was born 1897 in Alabama. i. JERREL QUINTON10 DAUGHTRY, b. Apr 1919, Wicksburg, Houston County Alabama. ii. HERMON DAUGHTRY, b. 1922, Wicksburg, Houston County Alabama. iii. RUDOLPH DAUGHTRY, b. 1924, Wicksburg, Houston County Alabama. iv. EARL DAUGHTRY, b. 1927, Wicksburg, Houston County Alabama. 80. NELLIE MAE9 DAUGHTRY (MARTIN JACKSON8, NELLY7 WOODHAM, CARON H "CARRIE"6 RILEY, JOHN5, EDWARD4, WILLIAM3, EDWARD2, EDWARD1) was born 1897 in Dale County Alabama, and died 14 Mar 1965 in Dothan, Houston County Alabama. She married HORACE G. COLLINS, son of JAMES COLLINS and HETTIE PHELPS. He was born Sep 1898 in Dale County Alabama. i. BILLY G.10 COLLINS, b. 20 Dec 1928, Wicksburg, Houston County Alabama; d. 26 May 2010, Rockford, Coosa County Alabama. 81. LEWIS L.9 DAUGHTRY (MARTIN JACKSON8, NELLY7 WOODHAM, CARON H "CARRIE"6 RILEY, JOHN5, EDWARD4, WILLIAM3, EDWARD2, EDWARD1) was born 03 Jan 1898 in Dale County Alabama, and died 13 Oct 1983 in Stone Mountain, DeKalb County Georgia. He married RUBY GLADYS. She was born 1902 in Alabama, and died 12 Aug 1955 in Houston County Alabama. i. GLADILOU10 DAUGHTRY, b. 1920, Wicksburg, Houston County Alabama, HH 277, age 31. 82. WILLIAM O.9 DAUGHTRY (ALBERT OLIVER8, NELLY7 WOODHAM, CARON H "CARRIE"6 RILEY, JOHN5, EDWARD4, WILLIAM3, EDWARD2, EDWARD1) was born 17 Apr 1894 in Dale County Alabama, and died Jul 1936 in Houston County Alabama. He married SUSIE M.. She was born 1895 in Dale County Alabama. i. WILLIAM F.10 DAUGHTRY, b. 1925, Geneva County Alabama. ii. MARY L. DAUGHTRY, b. 1927, Geneva County Alabama. 83. LILLIAN R.9 POWERS (MEDIA A. M.8 DAUGHTRY, NELLY7 WOODHAM, CARON H "CARRIE"6 RILEY, JOHN5, EDWARD4, WILLIAM3, EDWARD2, EDWARD1) was born Jan 1887 in Dale County Alabama. She married CROWFORD. i. JAMES ALDRICK10 CROWFORD, b. 1904, Dale County Alabama. 84. MAJOR MAJOR SYBURT9 POWERS (MEDIA A. M.8 DAUGHTRY, NELLY7 WOODHAM, CARON H "CARRIE"6 RILEY, JOHN5, EDWARD4, WILLIAM3, EDWARD2, EDWARD1) was born Mar 1892 in Dale County Alabama, and died 25 Aug 1962 in Ozark, Dale County Alabama. He married ANNIE ADORA MIXON. She was born 1889 in Dale County Alabama, and died 12 Sep 1966 in Ozark, Dale County Alabama. i. TALLIE EARNEST10 POWERS, b. 07 Dec 1919, Dale County Alabama; d. 31 Jul 1999, Carrollton, Denton County Texas. 122. ii. HARRY G. POWERS, b. 31 Mar 1921, Dale County Alabama; d. 12 Aug 2010, Jackson, Clarke County Alabama. iii. LULA BEATRICE POWERS, b. 1924, Dale County Alabama; d. 17 Nov 1939, Enterprise Coffee County Alabama. iv. LENA POWERS, b. Jan 1930, Dale County Alabama; m. ENFINGER, 22 Mar 1947, Dale County Alabama. 85. MAJOR DEWEY9 DAUGHTRY (JAMES WILBURN8, NELLY7 WOODHAM, CARON H "CARRIE"6 RILEY, JOHN5, EDWARD4, WILLIAM3, EDWARD2, EDWARD1) was born 05 Oct 1899 in Dale County Alabama, and died 30 Dec 1967 in Ozark, Dale County Alabama. He married MAUDE JORDAN. She was born 1902 in Dale County Alabama, and died 27 Oct 1964 in Ozark, Dale County Alabama. i. MIRIAM JEANETTE10 DAUGHTRY, b. Sep 1919, Dale County Alabama. ii. JEAN DAUGHTRY, b. 1925, Dale County Alabama. iii. MILDRED DAUGHTRY, b. 1927, Alabama. iv. JAMES DAUGHTRY, b. 1929, Birmingham, Jefferson County Alabama. 86. ALBERT9 DAUGHTRY (JAMES WILBURN8, NELLY7 WOODHAM, CARON H "CARRIE"6 RILEY, JOHN5, EDWARD4, WILLIAM3, EDWARD2, EDWARD1) was born 20 Sep 1903 in Geneva County Alabama, and died 03 Oct 1996 in Akron, Summit County Ohio. He married OLA L.. She was born 25 Jan 1908 in Tennessee, and died 26 May 1991 in Norton, Summit County Ohio. i. ALBERT JOSEPH10 DAUGHTRY, b. 22 Mar 1927, Akron, Summit County Ohio; d. 02 Mar 2011, Sandusky, Erie County Ohio. 87. SANFORD9 DAUGHTRY (SAMUEL HILBURN8, NELLY7 WOODHAM, CARON H "CARRIE"6 RILEY, JOHN5, EDWARD4, WILLIAM3, EDWARD2, EDWARD1) was born Apr 1900 in Geneva County Alabama, and died 10 Jul 1933 in Houston County Alabama. He married SUSIE. She was born 1900 in Alabama. i. HENRY10 DAUGHTRY, b. 1923, Dale County Alabama. ii. ARTHUR DAUGHTRY, b. 1928, Dale County Alabama. 88. LAMAR W.9 GLOVER (IDA T.8 DAUGHTRY, NELLY7 WOODHAM, CARON H "CARRIE"6 RILEY, JOHN5, EDWARD4, WILLIAM3, EDWARD2, EDWARD1) was born 18 Apr 1902 in Dale County Alabama, and died 25 May 1996 in Ozark, Dale County Alabama. He married THELMA MATTHEWS. She was born 1906 in Dale County Alabama, and died 26 Nov 1948 in Ozark, Dale County Alabama. i. VONZELL10 GLOVER, b. 1929, Dale County Alabama. 89. TEE W.9 GLOVER (IDA T.8 DAUGHTRY, NELLY7 WOODHAM, CARON H "CARRIE"6 RILEY, JOHN5, EDWARD4, WILLIAM3, EDWARD2, EDWARD1) was born 03 Jul 1902 in Dale County Alabama, and died 30 Mar 1995 in Ozark, Dale County Alabama. He married LOU ELLA HEAD. She was born 1910 in Dale County Alabama. i. IDA M.10 GLOVER, b. 1928, Dale County Alabama. ii. PHILIP V. GLOVER, b. 1929, Dale County Alabama. 90. JOHN D.9 GLOVER (IDA T.8 DAUGHTRY, NELLY7 WOODHAM, CARON H "CARRIE"6 RILEY, JOHN5, EDWARD4, WILLIAM3, EDWARD2, EDWARD1) was born 1908 in Dale County Alabama. He married ANNA J.. She was born 1910 in Dale County Alabama. i. JANICE10 GLOVER, b. 1929, Dale County Alabama. 91. CHARLES LEE9 NOWLING (JULIA ANN8 MAUND, CYNTHIA C.7 WOODHAM, CARON H "CARRIE"6 RILEY, JOHN5, EDWARD4, WILLIAM3, EDWARD2, EDWARD1) was born 02 Dec 1891 in Walton County Florida, and died 24 Apr 1973 in Walton County Florida. He married MISSOURI MCLEOD. She was born 1891 in Walton County Florida, and died Jan 1960 in Walton County Florida. i. BERTHA10 NOWLING, b. 1912, Walton County Florida. ii. WILL NOWLING, b. 1913, Alabama. iii. ANDERSON NOWLING, b. 1914, Walton County Florida. iv. WILLARD NOWLING, b. 1916, Walton County Florida. v. CUMIE NOWLING, b. 1920, Walton County Florida. vi. MARGERY NOWLING, b. 1923, Walton County Florida. vii. OPAL NOWLING, b. 1925, Walton County Florida. 92. HILBORN HOBSON9 NOWLING (JULIA ANN8 MAUND, CYNTHIA C.7 WOODHAM, CARON H "CARRIE"6 RILEY, JOHN5, EDWARD4, WILLIAM3, EDWARD2, EDWARD1) was born 07 Feb 1899 in Walton County Florida, and died 22 Jan 1954 in Escambia County Florida. He married MARY ETHEL. She was born 16 Nov 1898 in Walton County Florida, and died 30 Apr 1973 in Lynn Haven, Bay County Florida. i. MADELINE H.10 NOWLING, b. 1923, Walton County Florida. ii. GERALDINE H. NOWLING, b. 1925, Walton County Florida. iii. HILBURN H. NOWLING, b. 1926, Walton County Florida. 93. ALEXANDER9 NOWLING (JULIA ANN8 MAUND, CYNTHIA C.7 WOODHAM, CARON H "CARRIE"6 RILEY, JOHN5, EDWARD4, WILLIAM3, EDWARD2, EDWARD1) was born 16 Oct 1903 in Walton County Florida, and died 07 Oct 1971 in DeFuniak Springs, Walton County Florida. 123. i. SHIRLEY H.10 NOWLING. 94. JESSE JACK9 NOWLING (JULIA ANN8 MAUND, CYNTHIA C.7 WOODHAM, CARON H "CARRIE"6 RILEY, JOHN5, EDWARD4, WILLIAM3, EDWARD2, EDWARD1) was born 13 Oct 1906 in Walton County Florida, and died Mar 1965 in Walton County Florida. He married ALLIE CUMBIE. She was born 05 Jan 1912 in Walton County Florida, and died 13 Jun 1965 in Walton County Florida. i. WILLIE M.10 NOWLING, b. 1929, Walton County Florida. 95. HENRY DEWEY PIPPIN9 BUSH (HENRY JOHNSON8 PIPPIN, ELLEN7 WOODHAM, CARON H "CARRIE"6 RILEY, JOHN5, EDWARD4, WILLIAM3, EDWARD2, EDWARD1) was born 16 Jun 1898 in Washington County Florida, and died 02 Nov 1960 in Opp, Covington County Alabama. He married VADER SASSER. She died 22 Jan 1987 in Montgomery, Montgomery County Alabama. 124. i. JOHN D.10 BUSH, b. Alabama. 125. ii. JOSEPH BUSH, b. Alabama. 126. iii. DEMPSEY BUSH, b. Alabama. 127. iv. CHARLIE WADE BUSH, b. Alabama. 96. PARRY LEE9 BUSH (HENRY JOHNSON8 PIPPIN, ELLEN7 WOODHAM, CARON H "CARRIE"6 RILEY, JOHN5, EDWARD4, WILLIAM3, EDWARD2, EDWARD1) was born 17 Dec 1902 in Vernon, Washington County Florida, and died Jun 1975 in Vernon, Washington County Florida. She married J. WESLEY PARRISH. He was born 1904, and died 1998. 128. i. HARRY WAYNE10 PARRISH, b. 17 Oct 1935; d. 22 Aug 1980. 129. ii. YVONNE MARIE PARRISH, b. 28 May 1941. 97. SARA MARGARET9 BUSH (HENRY JOHNSON8 PIPPIN, ELLEN7 WOODHAM, CARON H "CARRIE"6 RILEY, JOHN5, EDWARD4, WILLIAM3, EDWARD2, EDWARD1) was born 05 Mar 1904, and died 13 Jun 1960. She married J. D. BURKE. He was born 1897, and died 1966. 130. i. JAMES WILBURN10 BURKE, b. 05 Jan 1922; d. 16 Mar 1975. 131. ii. GEORGIA MAE BURKE, b. 10 Sep 1924. 132. iii. SARA NELL BURKE, b. 15 Jan 1927. 133. iv. CHARLES A. BURKE, b. 16 Jan 1929. 134. v. FARRELL BURKE, b. 17 Apr 1931. 135. vi. BILLY RAE BURKE, b. 06 Nov 1937. 98. ARTHUR JHUE9 BUSH (HENRY JOHNSON8 PIPPIN, ELLEN7 WOODHAM, CARON H "CARRIE"6 RILEY, JOHN5, EDWARD4, WILLIAM3, EDWARD2, EDWARD1) was born 29 Apr 1906, and died Apr 1975 in Sanford, Seminole County Florida. He married GERTRUDE COLVIN 24 Nov 1933 in Florida. She was born 1912. 136. i. HARRY CLYDE10 BUSH, b. 13 Oct 1934. 137. ii. MAX D. BUSH, b. 18 Oct 1935. 138. iii. DONNIE HUE CORKY BUSH, b. 12 Jul 1938. 99. EDWARD PAUL9 BUSH (HENRY JOHNSON8 PIPPIN, ELLEN7 WOODHAM, CARON H "CARRIE"6 RILEY, JOHN5, EDWARD4, WILLIAM3, EDWARD2, EDWARD1) was born 29 Sep 1908, and died 05 Sep 1935 in Henderson Alabama. He married (1) LAURIE ADDIE BROWN. She was born 1909, and died 1931. He married (2) CRESSY ANN BURKE. 139. i. LEWIS EDWARD10 BUSH, b. 30 Jul 1931. 140. ii. JAMES RUFUS10 BUSH, b. 19 Dec 1933. 100. HAZEL CHRISTINE9 BUSH (HENRY JOHNSON8 PIPPIN, ELLEN7 WOODHAM, CARON H "CARRIE"6 RILEY, JOHN5, EDWARD4, WILLIAM3, EDWARD2, EDWARD1) was born 31 Aug 1910 in Slocumb, Houston County Alabama. She married OWEN VAUGHN HILBURN 01 Aug 1926 in Covington County Alabama. He was born 1904 in Troy, Pike County Alabama, and died 1986 in Pensacola Florida. 141. i. JAMES RUFUS10 HILBURN, SR, b. 22 Nov 1927, Alabama; d. 07 Sep 1995, Pensacola Florida. 142. ii. ROBERT VAUGHN HILBURN, b. 23 Mar 1937, Covington County Alabama. 101. HERBERT OTIS9 BUSH (HENRY JOHNSON8 PIPPIN, ELLEN7 WOODHAM, CARON H "CARRIE"6 RILEY, JOHN5, EDWARD4, WILLIAM3, EDWARD2, EDWARD1) was born 24 Sep 1912, and died 23 Mar 1988 in Covington County Alabama. He married INEZ BROOKS. She was born 1917 in Andalusia, Covington County Alabama. 143. i. KENNETH WAYNE10 BUSH, b. 21 Sep 1942.
ii. JERRY OTIS BUSH, b. 10 Sep 1946; m. MEIDA BURROW, 1977. 102. BURLEY LEE9 WOODHAM (WALTER LEWIS8, DANIEL WILLIAM7, CARON H "CARRIE"6 RILEY, JOHN5, EDWARD4, WILLIAM3, EDWARD2, EDWARD1) was born 14 Nov 1898 in Dale County Alabama, and died 08 Mar 1958 in Dothan, Houston County Alabama. He married ALMA CLEMENTS, daughter of J. CLEMENTS and MARY E.. She was born 23 Sep 1902 in Jefferson County Alabama, and died 22 Sep 1974 in Dothan, Houston County Alabama. i. SAMUEL10 WOODHAM, b. Oct 1918, Dale County Alabama; d. 08 Mar 1964, Dothan, Houston County Alabama. 144. ii. WILLIE LEE WOODHAM, b. 1923, Dale County Alabama; d. 03 Nov 1967, Fort Rucker, Dale County Alabama. 103. CAMMIE LEE9 WOODHAM (MARVIN BISHOP8, DANIEL WILLIAM7, CARON H "CARRIE"6 RILEY, JOHN5, EDWARD4, WILLIAM3, EDWARD2, EDWARD1) was born 04 Apr 1913 in Dale County Alabama, and died 06 Oct 1971 in Dale County Alabama. He married MARY MYRTLE PEACOCK 12 Sep 1934 in Dale County Alabama, daughter of FITZHUGH PEACOCK and ROBERTA NEWTON. She was born 03 Mar 1915 in Dale County Alabama. i. JERRY DANIEL10 WOODHAM, b. 07 Feb 1937, Dale County Alabama; m. SYBLE ELIZABETH DEESE, 23 Oct 1976; b. 24 Dec 1928, Dale County Alabama; d. 14 Feb 2009, Panama City, Bay County Florida. 145. ii. OLEN PEACOCK WOODHAM, b. 11 Jul 1944, Midland City, Dale County Alabama. 104. PERRY MARLEY9 WOODHAM (MARVIN BISHOP8, DANIEL WILLIAM7, CARON H "CARRIE"6 RILEY, JOHN5, EDWARD4, WILLIAM3, EDWARD2, EDWARD1) was born 25 Jul 1925 in Dale County Alabama, and died 06 Aug 2006 in Dothan, Houston County Alabama. He married BONNIE LEE CARR, daughter of FOY CARR and LILLIE. She was born 31 Oct 1925, and died 24 May 1998 in Dale County Alabama.